This is the true tale of two women; Marj, my sister-in-law, and her friend Debbie. Sorry Marj, but it is too good of a story not to share, especially for those who know these women. 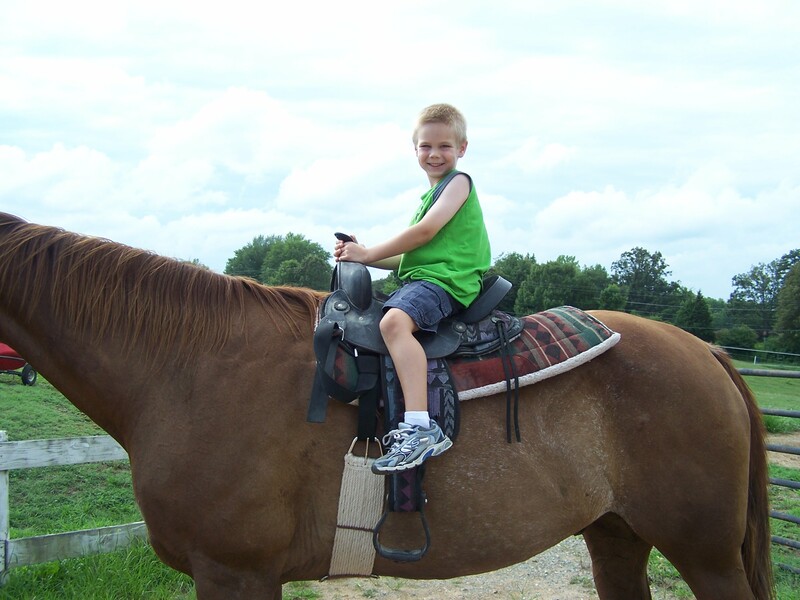 Recently at their church they studied the book “Radical” by David Platt. At the end of the study they were challenged to do something out of their “comfort zone.” Marj, Debbie, their husbands, and several others from their church decided to go to Costa Rica on a service project. They flew on a small prop plane from Pensacola to Miami. Marj is not a seasoned flier and told Rich, “Do not lose me at the airport.” They had a tight flight schedule so while the men were waiting to retrieve the luggage from the bottom of the plane Marj and Debbie made a quick run to the “little girls room”. Mission accomplished they went to meet the men at the terminal gate as agreed. The men were not there so they sat down at gate D5 and waited. Still no men. Finally their cell phone rang, “Where are you? They are calling for you over the intercom and it is the last boarding call.” Oh, no! The correct gate was E5. Immediately Marj and Debbie took off in a mad dash through the terminal (D5 was all the way at the end of the concourse), down the escalator, onto the tram, up the escalator and down through the terminal. But Marj had one problem. Because the men were trying to collect and gather all the luggage, she took Rich’s backpack filled with books with her. She discovered it is very difficult to run with a heavy backpack of books on your back. Debbie took her turn and huffing and puffing they got to gate E5 just in time to wave goodbye to the plane backing away from the gate with their men on board. Now from the men’s end of the drama… They did not want to get on the plane without their wives so the airline personal let them stay off as long as possible but finally they told them they would have to board or they would sell their seats. Knowing the women were almost there they boarded but then the airline sold the women’s seats and the doors closed. The men were stuck with “strangers” in their wives seats. Marj said she would have been frantic if Debbie hadn’t been with her. The airline booked them on the next flight out to San Jose. It wasn’t long until another member of their group showed up. He was flying in from Delaware and got detained in Baltimore. So now they were a group of three. When they got to San Jose the men checked in with the airline and learned that their wives were only 1-1/2 hours behind. The women were relieved to find them waiting for them and some of their luggage that had not yet arrived. Marj said the whole trip accomplished it’s intended purpose well. Not only did it start out of her comfort zone, she had to paint and varnish the whole time they were there which was something she was not fond of or had done much of. And it was also hot, very hot with no air-conditioning, and most of the time they were drenched with sweat and stinky! The two days before they came home they did some sightseeing and one of the things they were scheduled to do was a zip line over the rain forest. She was not thrilled about this prospect but was assured another option was a gondola. When the bus was almost to the zip-line the driver asked who was doing the gondola. Marj was the only one who raised her hand. She was not leaving the group all by herself so she was stuck-zipping at neck-break speed down the mountain high above the trees. She said she never saw the view the others talked about-you can’t when your eyes are closed! If any part of my body hurts it is usually my feet. From time to time, my feet give me a fit. Sometime it is a corn on the side of my foot, or a sore spot on the ball of my foot. Most of the time it is just tired, sore feet. Now it is my heel. For years I have had to wear “granny shoes” and only admire the stylish ones other gals wear. However, I must say, I am so grateful to SAS for making comfortable shoes for folks like me. About three weeks ago on a Sunday afternoon in the matter of a few hours I developed a pain in my left heel that left me limping and hopping in pain; excruciating, piercing pain. 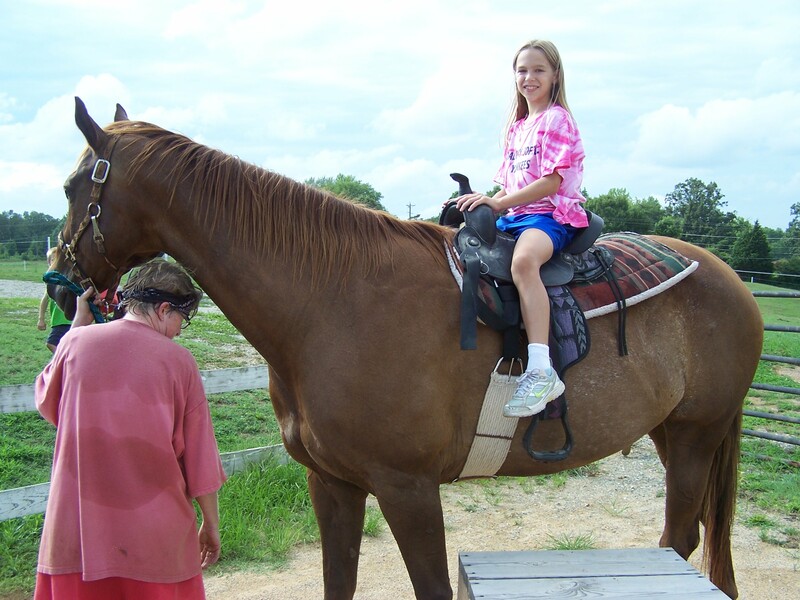 And this was just after a vacation where we mostly rode and I was on my feet a minimal amount of time. I should have been rested and refreshed. I figured I had somehow bruised it but didn’t have a clue how. Finally after about a week of almost unbearable pain, I hobbled to Dr. Earnest, a customer who is a podiatrist. He confirmed what I was beginning to figure out. I had plantar fasciitis. Let me tell you, this is not a fun ailment! I have been limping and hobbling like a crippled old woman!!!! My toes are even sore from walking on them. One evening Gene asked me if I needed a walker. It wouldn’t have done any good as both feet were hurting so bad I could barely put weight on either one. Try walking to bed on no feet! The “good” foot was reacting from protecting my hurting foot. I have also found that there is a “club” of other fellow sufferers! Finally I am now into a “healing” regime. 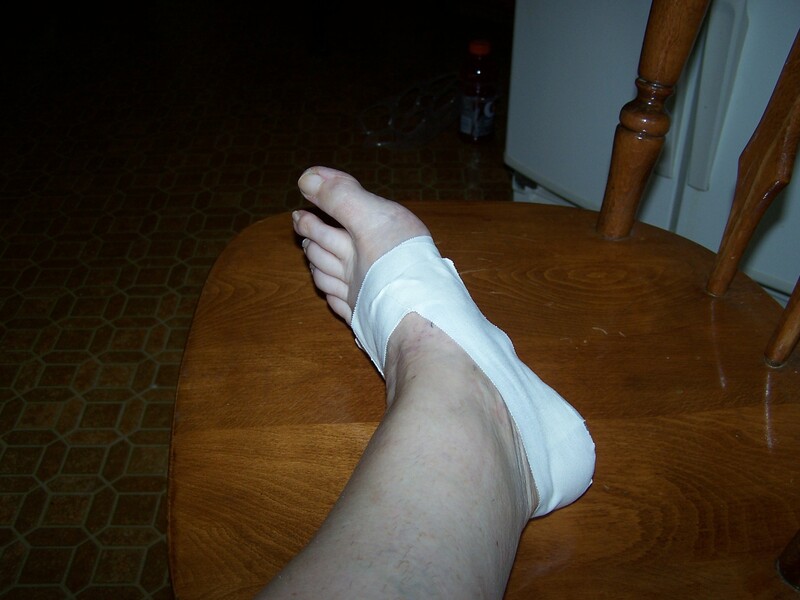 I am learning about stretching the plantar ligament and reducing swelling with ice. 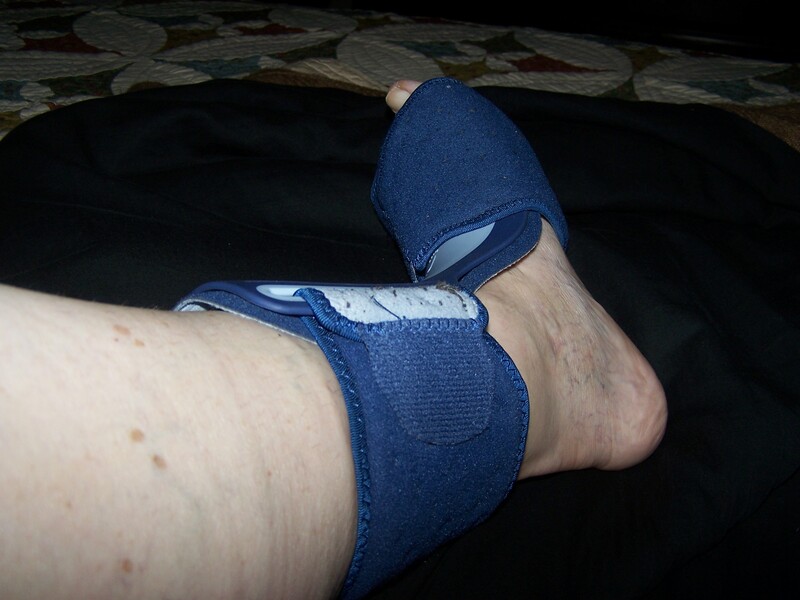 Today I got my “air boot”; a stylish, cushiony, navy-blue cam-walker with an air pump designed to keep my foot straight so the ligament can heal without being constantly re-torn every time I get up in the morning after a night of healing and rest. The fun part is learning to rock this baby from heel to toe as I walk. This lovely, clunky, $157 boot is now my best friend and will go everywhere I go for the next month or so. Without this boot I won’t heal. In about a week I will get my orthodics designed to fit into my shoes and adjust my step. 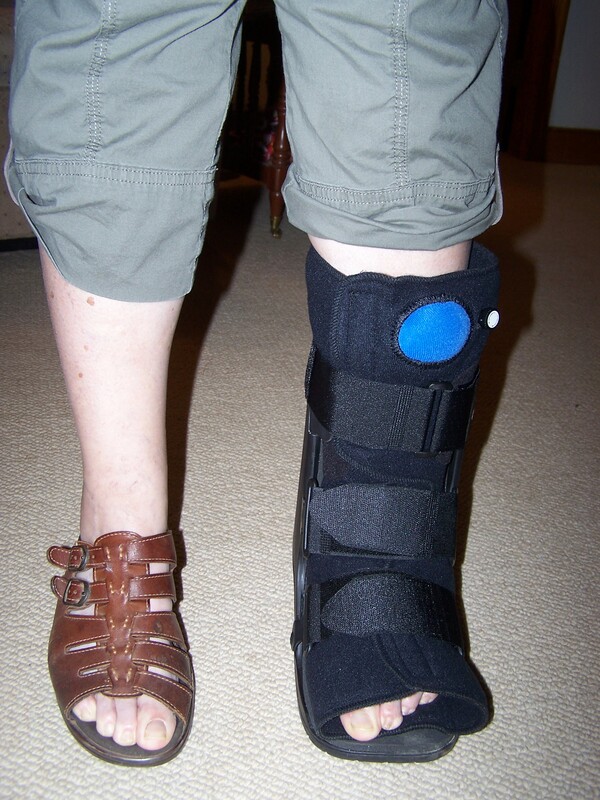 The doctor said I will even have to wear the orthodic in my boot! Oh, me!!! I know, it can be worse and I am grateful it is “healable” with proper care. Two weeks ago I told the doctor I was ready to cut off my foot! By the way fasciitis has one of the strangest spellings for a word. I believe someone said it is the only word with 2 ii’s in a row. (I don’t know for sure if this is a fact). I think I know why…your feet hurt so bad all you can think of is i…i…i! 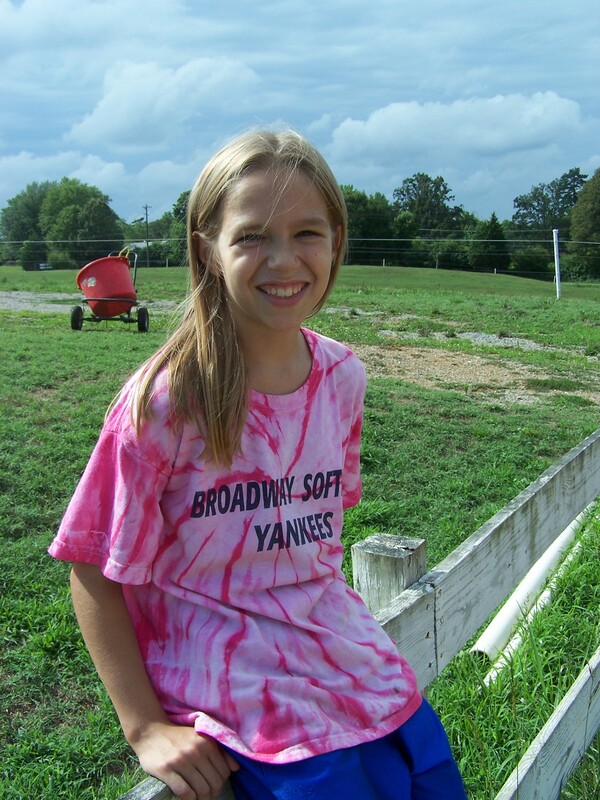 My progress…at one month into this ordeal! I am doing so much better but I am not totally healed yet! Fellow sufferers have told me I will get there and I think I am starting to believe them!!! There is no instant “fix” or cure! It is essential that I do my foot stretching exercises. I will share with you what I am doing, besides using the cam-walker, just in case you are suffering and need some help. I must say I am NOT a doctor or a nurse. If you are suffering, please see a doctor and let them help you. I’ve had people tell me that suffered for months or years before getting professional help. This is just my journey….. The doc initially wrapped my foot in 2″ wide brown medical tape. He said the tape was available at the drugstore but our drugstore does not have it so I used 2″ wide white adhesive tape from the our feed store that is used for taping horses legs. That worked for several weeks and then it pulled some skin off the bottom of my foot and I had to stop. Here is how you tape. Cut some short pieces of tape-maybe 5″ long and put around the bottom of your foot as shown below, going all the way to the heel keeping your foot relaxed. Do not pull tape tight. Just put it on naturally and relaxed. 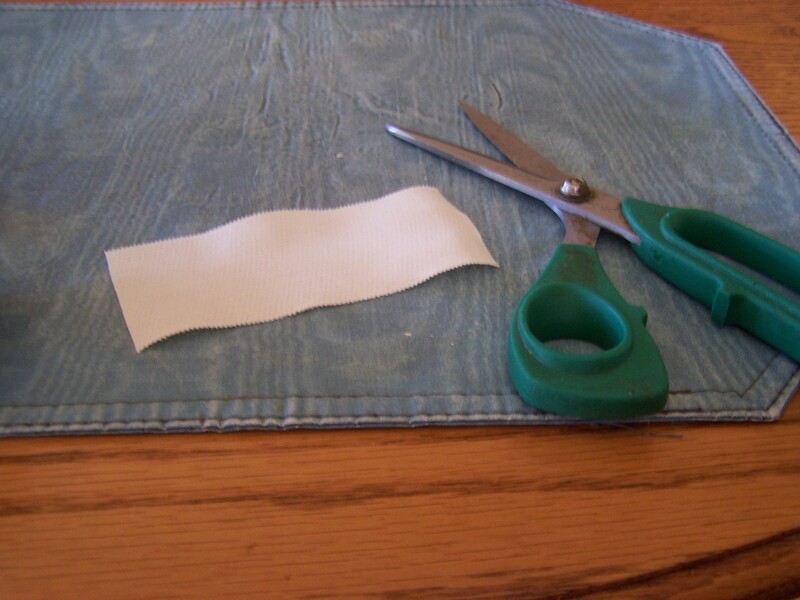 Cut another piece 3-4 inches long and lay on top of your foot with sticky side up. 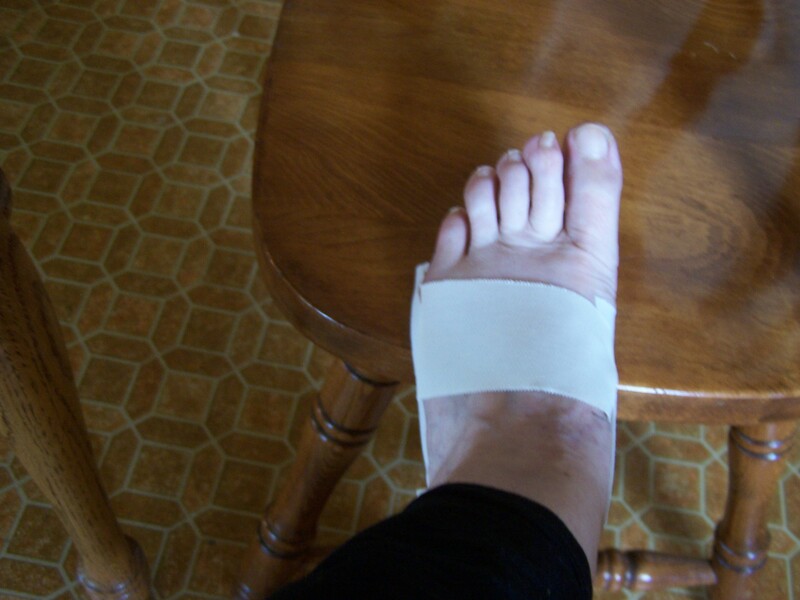 This will keep the next step of taping from sticking to the sensitive top of your foot. 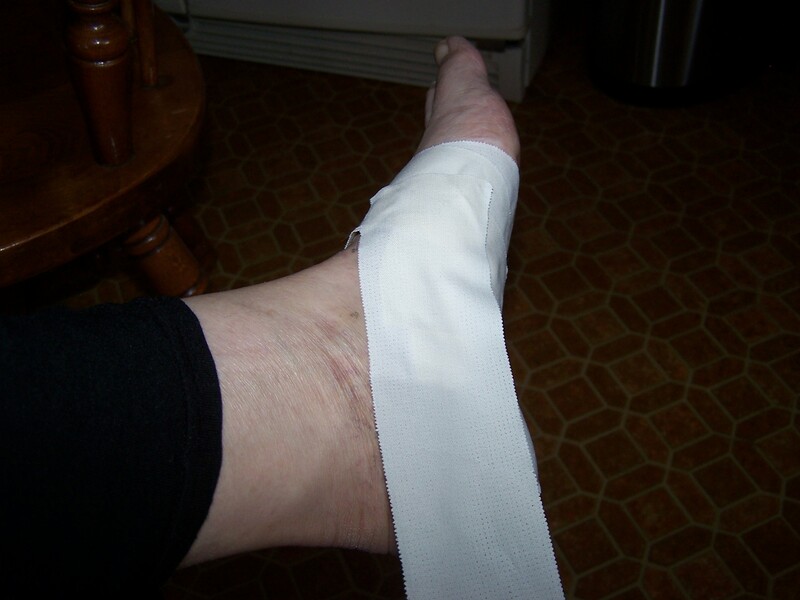 Take a longer piece of tape and lay it on top of the sticky side up tape and wrap it around the bottom of your foot. This helps to hold the arch ligaments in place. Then cut a long piece of tape 12-14″ and wrap it around the foot starting near the toes, go around the heel and up the other side. You have now made yourself a taped sock! It will feel good and it is amazing the support it gives. You either have to keep your foot dry when you take a shower or remove it every evening (like I did) and redo in the morning. I was glad to have it off my foot at night. I got a “night” brace at the drug store to wear at night. It is soft and keeps your foot from getting turned in funny positions during the night. It also holds the toes slightly pointed back towards your body. This also feels really, really good. You can not walk in it and if you have to get up during the night you have to slip it off and remember-stretch those toes before hitting the floor! The other absolutely essential part of getting better is the foot stretches. The doc tells you this, the people where I got my cam-walker said it and fellow sufferers have verified the need for doing them. Foot Stretches-there are numerous ones, but I will tell you about the ones I am doing. First thing in the morning-before your foot hits the floor- bend your toes back towards your body. You can feel the ligament in the heel pull. Bend your toes back and hold several seconds, repeat several times. If I do not do this one I have ruin my whole day. Your foot ligaments heal and stiffen during the night. You have to release that ligament or you will have shooting pain and feel like you are walking on a ball. You have just undone the healing that took place during the night. Numerous times during the day I will flex my toes back as far as I can back towards my body. (You can use a towel to pull your toes back if you are too stiff to do it). Put your hands against the wall-I put one on each side of the door jam and set my feet back about 3 feet. Keep the foot straight with the heel on the ground and bend knee of the good leg. You will feel the muscles in the calf of your leg pull. Hold for 1-2 minutes, release and repeat several times. On a step, bring your toes on both feet as close to the edge as possible. Drop your heel slightly and hold. Again you will feel the ligament pull. I learned a hard lesson on this one-I dropped my heel to far and messed myself up for a day or so. The first time only drop the heel for 5 seconds. Each time add 5 seconds. Someone told me a 2by4 works good. You can’t overdrop your foot with it. I am still waiting on my orthodic and can hardly wait until it comes in. At this point my heel is not hurting me unless I am on it too much and I can now walk without pain. Yea! This is a big deal and I am so grateful to my Heavenly Father. I have been talking to Him about it also. This weekend I put my regular shoe on and cleaned the house. My foot got tired but I still had no heal pain. This was the first time I cleaned since this ordeal began. I simply had too much pain in my heel to be on my feet. I am still dealing with some general foot discomfort due to the cam-walker rubbing my little toe, my arch hurting, my shin getting use to the cam-walker, or my other foot hurting because of favoring my sore foot. I have talked to people who have suffered for months and years before getting better. I am making progress and I am seeing results! I am a long ways from where I was at a month ago. I have not needed a cortisone shot-at least not at this stage which is another option to help in the process. September 9: It is not over two months and I am totally pain-free. Praise the Lord. I still need to stretch my foot before I get up in the mornings but I am adjusted to my orthodics and no longer think about my feet all day long and every step I take. I have a recipe I really like for salsa. It is easy to make and tasty to eat. These ingredients are flexible and can be adjusted to suit your taste. 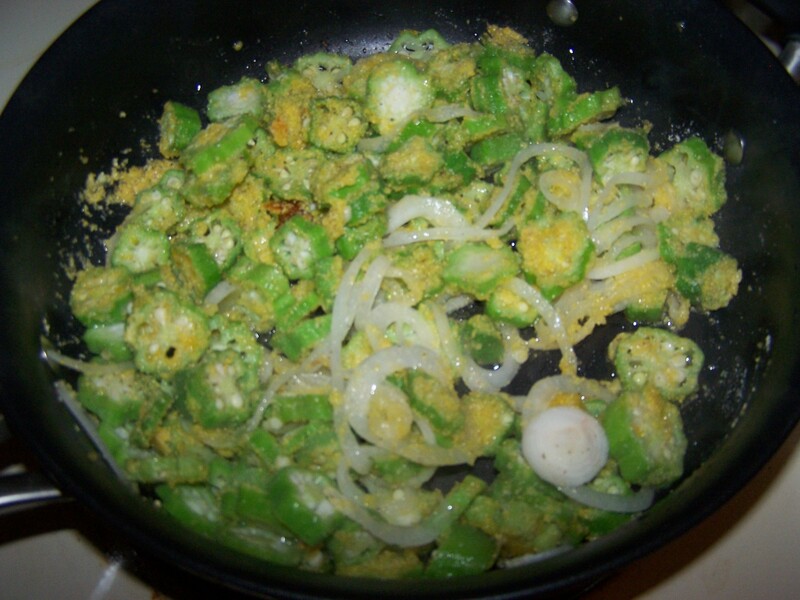 1/2 c. or 8 Jalapeno peppers, chopped (4 without seeds and 4 with seeds) and/or 6 cayene peppers, chopped (may use 1/2 tsp. dried peppers). The amount of peppers you use will determine how “hot” it is. I personally like a mild and only use one kind of the hot peppers. Cook salsa until all ingredients are soft. Mix 5 T. cornstarch to a little water and add to hot salsa to thicken. Fill pint jars with hot salsa and pressure can 5 pounds pressure for 10 minutes or hot water bath for 22 mins. Note: to pressure can use the same instructions in my blog “How to Can Tomato Juice”. Georgia is known for it’s peaches but the beautiful Shenandoah Valley of Virginia can also grow some awesome fruit. I have fallen in love with “Blazing Star”, a yellow peach from Turkey Knob Growers who are a part of Bowman’s Orchard in Timberville, VA. They were so sweet, juicy and as the saying goes “gorgeous as a peach!” They were so juicy I had to lean forward over the sink to eat one or I would have been wearing the juice on my front side! 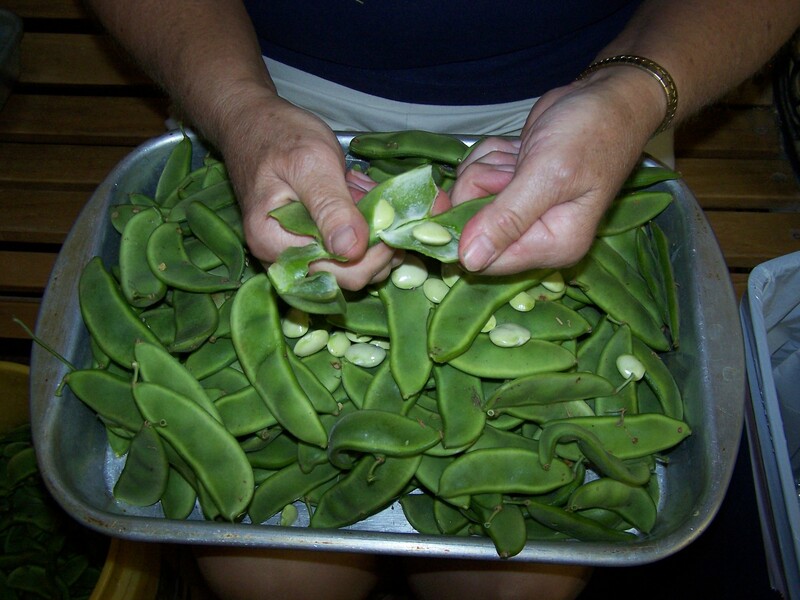 They also hold well while you are peeling and very importantly they are “cling-free”, which means the seed or pit is easy to pop out. They also have very little fuzz. 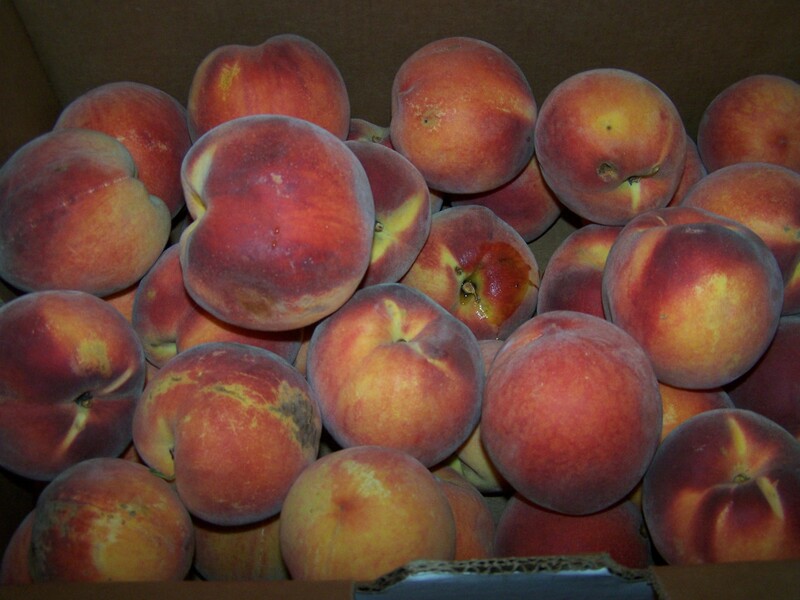 They have several “Star” peaches and Blushing Star is their white peach. I used to like Red Haven, a good older variety, but they have fallen out of my good graces as they have a tendency to cling tightly to the pit, making them very difficult and frustrating to process. You want your peaches to be soft but not mushy to process. If they are hard let them set for a day or so. When you give a little, gentle squeeze they should feel soft. There are two ways to remove the skins. My favorite way is to sit in my chair and peel. It takes me about 40 seconds with a sharp paring knife to cut the peach in half along the natural groove of the peach, pop the pit out and peel both halves. I peel in a circular motion around the half. 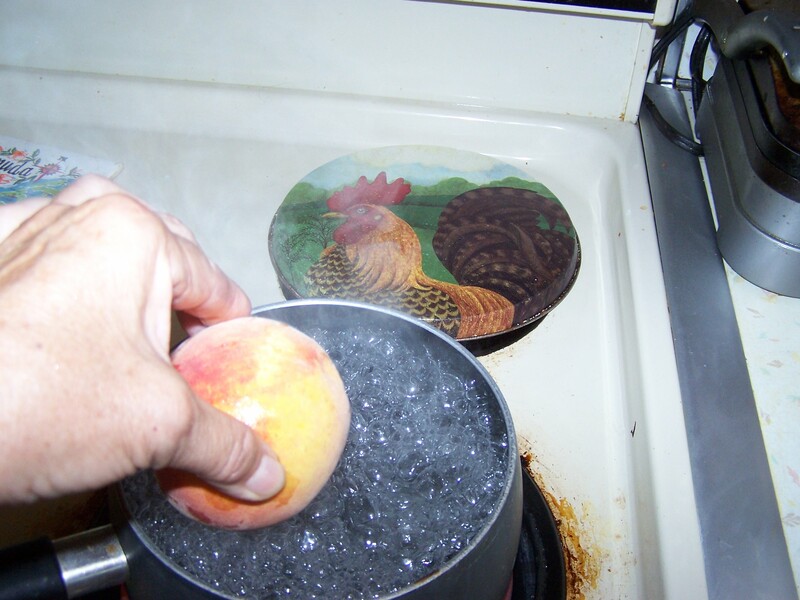 Another way to remove the skins is to drop the peach in boiling water for approximately 1 minute. 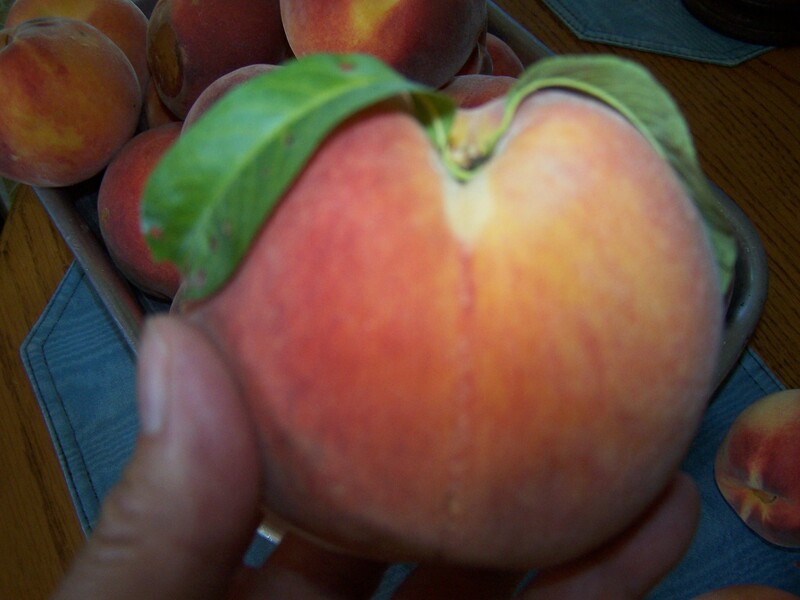 You can can peaches in halves, quarters, slices or chunks. I like to do some each way. The chunks I use to make peach cobbler or pie. 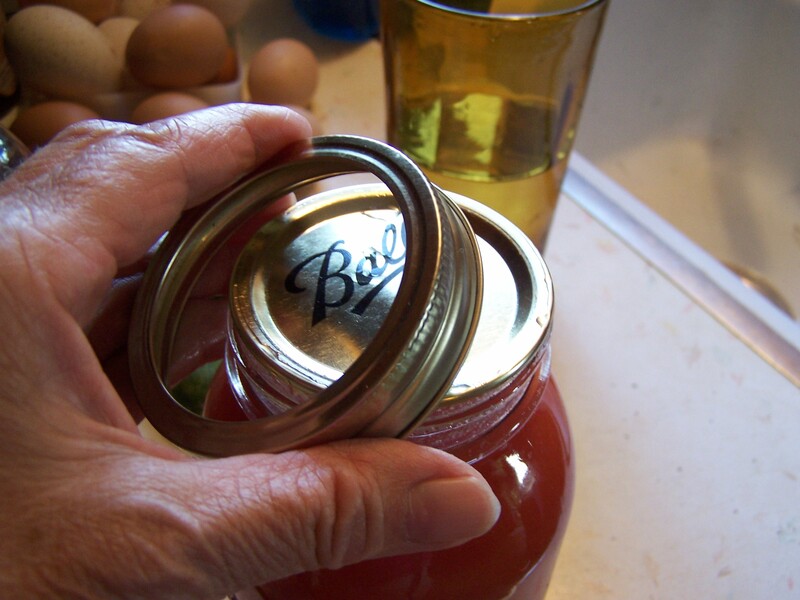 An easy way to put the halves in a jar (wide mouth jars work best) is to use a fork. Drop the peach face down and layer additional peaches face down on top. Fill the jars with a medium sugar brine. I simply use hot tap water-no sugar. 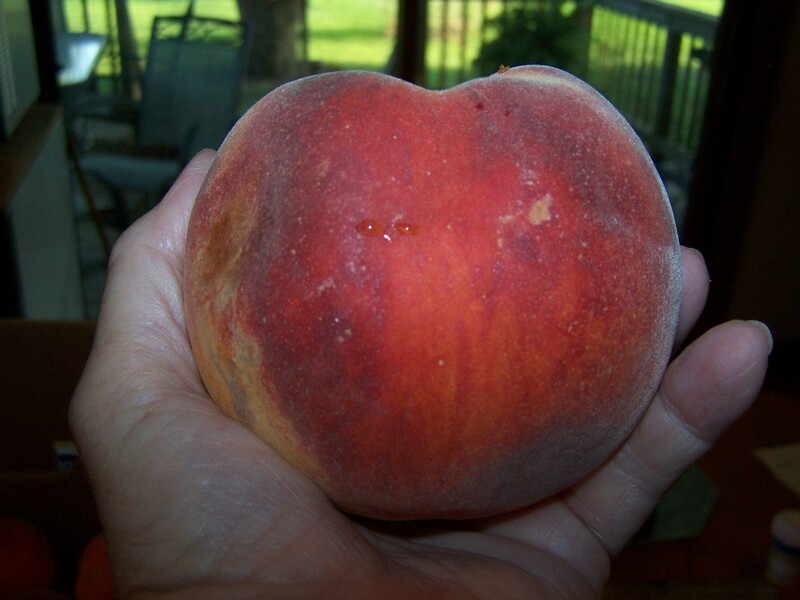 The peaches are so sweet and with Gene being pre-diabetic we use almost no sugar. Fill to the lip at the neck of the jar. Do not overfill. To make a medium sugar brine mix 2 cups sugar with 4 c. water. Fill the jars with brine. Another option is to put 1/2 c. per quart and fill with warm water. 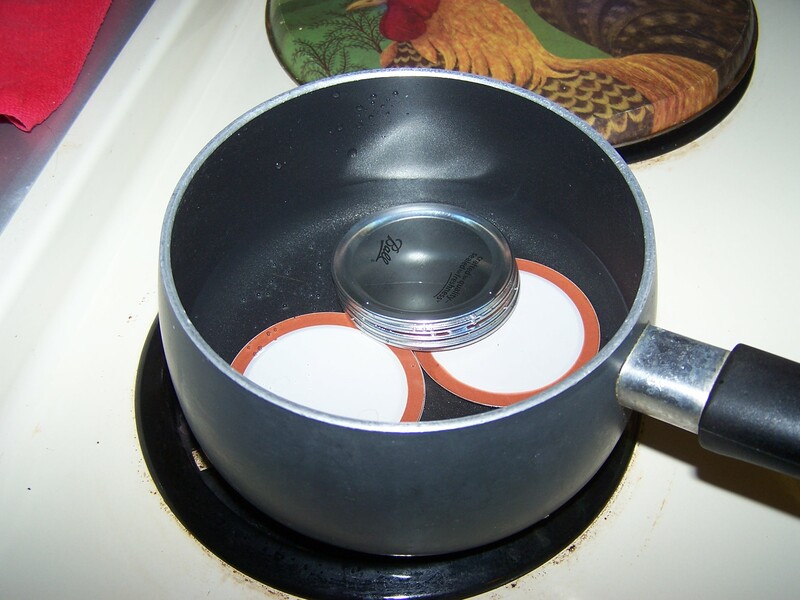 Boil the lids in water for a few minutes and set on top of filled jars. Add the ring and tighten securely. Put 2 quarts of water and 1 tsp. cream of tarter in the pressure cooker. 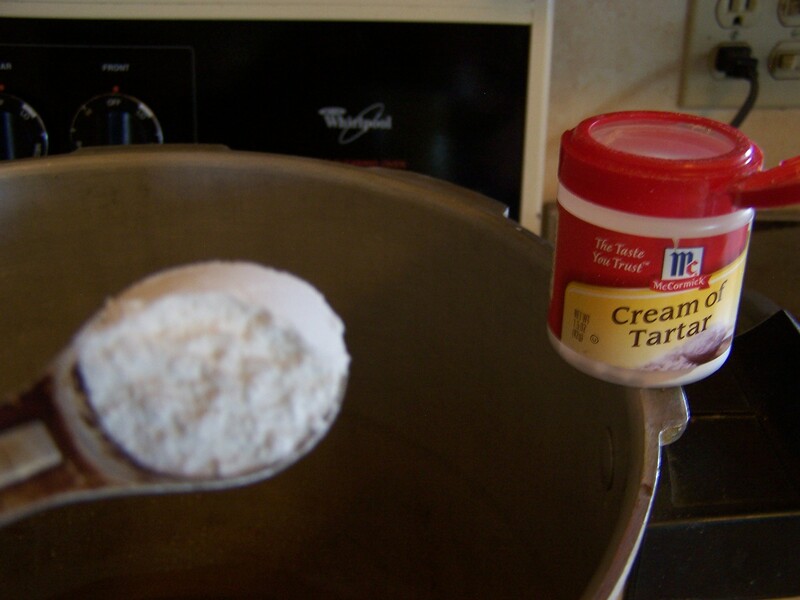 The cream of tarter keeps the inside of the canner looking shining. Set the jar into the pressure canner. Put the lid on the canner and when you see steam coming out of the vent hole on top put on the weight. The gauge will soon start to rise and you want 5 pounds of pressure for 8 minutes. I always set the timer so I do not forget about the canner. You do not want to leave the canner. Choose another project to do in the kitchen so you are close by. If you do walk away-even for a few seconds, take your timer with you so you have the reminder of the canner on the stove. The canner is very safe to use but if you forget about it and the gauge goes into the black danger zone you could end up with a hole in your kitchen ceiling! 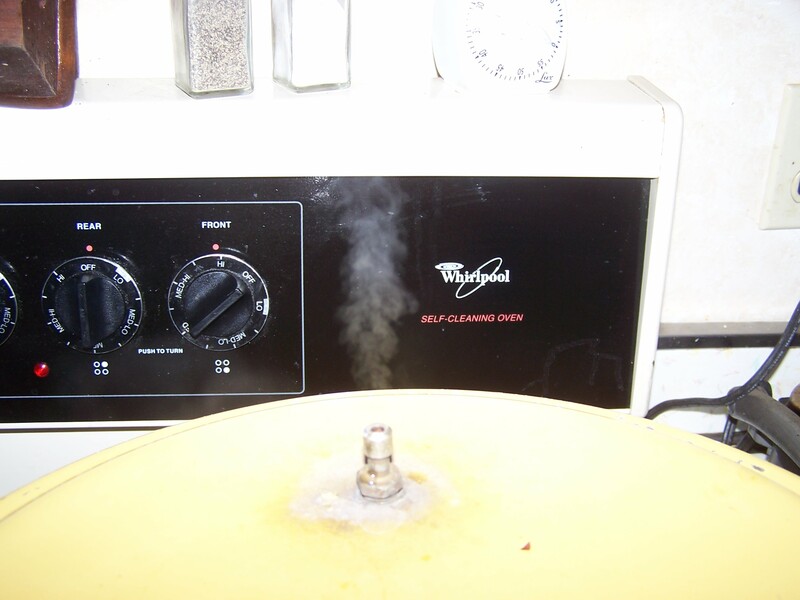 Once the allotted time is up, turn off the stove and let the gauge come down to zero. When the sound of air escaping from the vent has quit it is safe to open the canner and remove the jars. I set them on a towel on the counter to cool. Within a few minutes you will hear the delightful popping of the lids as they seal. Let the jars cool overnight and then remove the rings. The jars will stay sealed and store in a cool, dark room. In a warm, well-lit room the peaches have a tendency to darken over time. 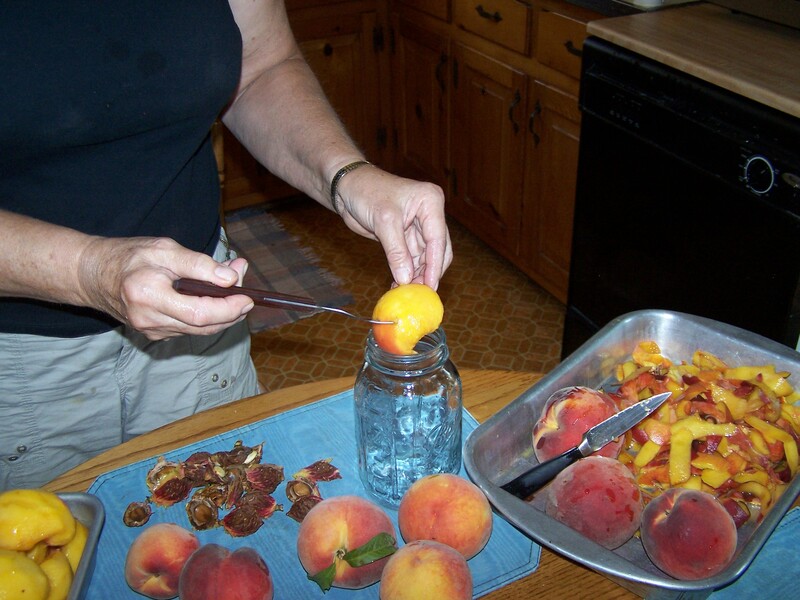 Simply peel, pit and slice peaches into freezer containers. 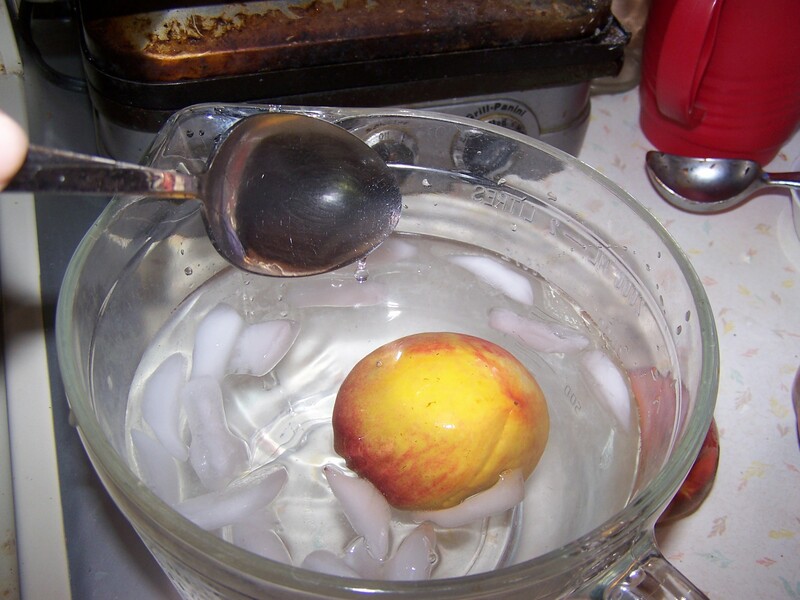 Sprinkle a little sugar over the layers of peaches and freeze. (Note: I do not use any sugar). 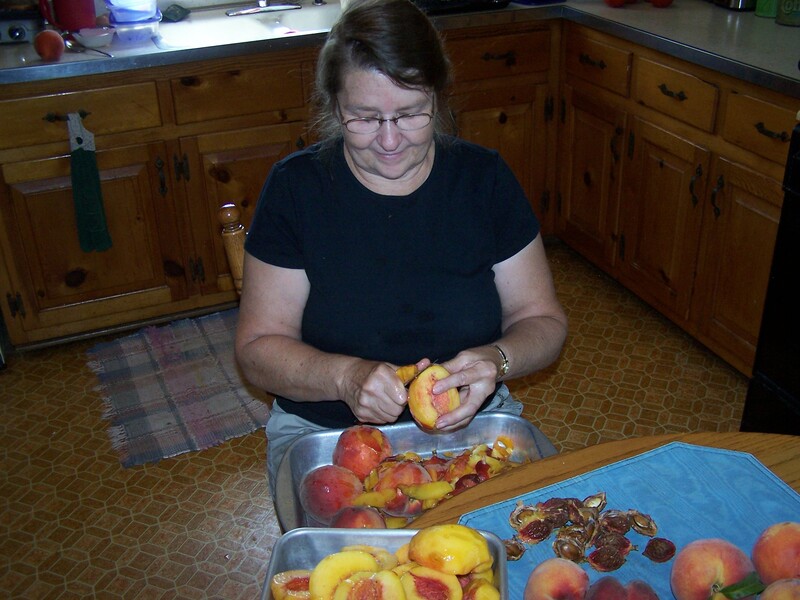 I use the peaches that are bruised or extra soft for jam. 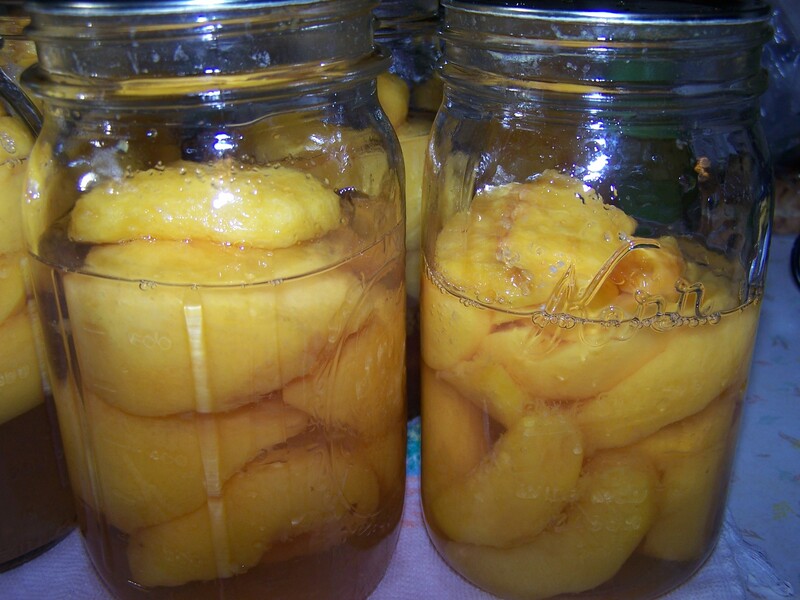 I use the recipe on the “pectin” box. I prefer freezer jam but they have recipes for jam, jelly, freezer and canned. I made the sugar-free this year. Questions: (These are in response to questions asked from my blog post). Why does the pit (seed) not want to pop out of my peach? If peaches are not quite ripe this can be a problem. But usually it is the variety of peach. I always make sure I buy “cling-free” peaches. I am not sure why any orchard would raise and sell peaches that aren’t “cling-free” but they do. Red Haven is a good example of a peach that can go either way. They are a very good flavored peach. I love them. But sometimes they are “cling-free” and sometimes they are not. When the pit will not release you mutilate the peach trying to free it. I refuse to buy them. For additional canning questions, look at my blog post called “Frequently Asked Canning Questions”. This blog posting will be continually updated as I receive questions. If you have a question you may comment at the end of the blog or email me at hffinc@i-c.net. I also welcome additional comments or answers. 1. If a can does not seal is it safe to eat? Absolutely. You will know within half an hour if it does not seal. Simply put it in the refrigerator and eat within 4 or 5 days. It would have the same self life as any opened can of vegetables. 2. Can I “re-can” a jar that does not seal? You sure can. Open the jar and make sure the rim is clean. Use a new lid and process the same as the first time. 3. Can I turn the canner off and come back later to finish canning? No. You must finish the process all at one time. The pressure needs to be held at a certain level for a prescribed number of minutes. 4. 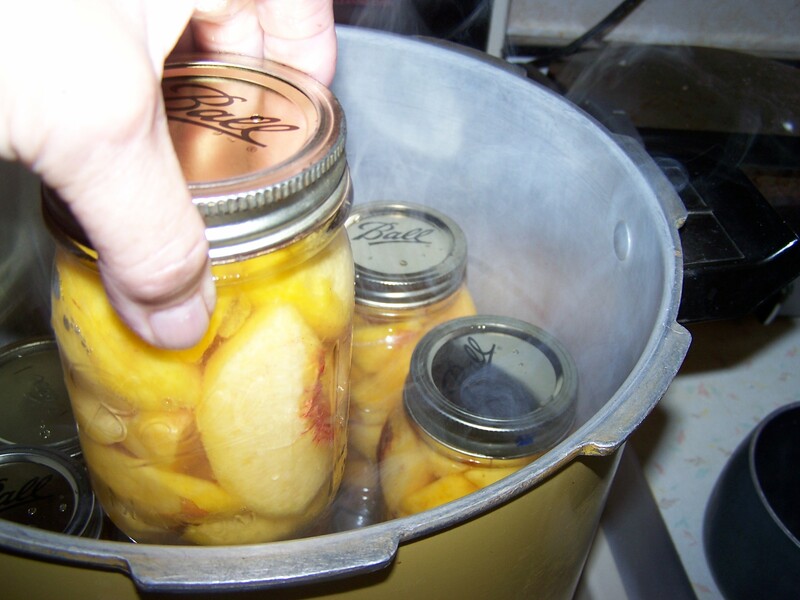 After canning what if my jar of peaches or snaps has lost some of the water? Sometimes this happens and you don’t know why. As long as the jar has sealed they are safe. 5. How do I know if the jar has sealed? The lid will pop inward and when you press your finger on the lid it is firm. If the center is bubbled up and there is a give in the lid it has not sealed. 6. Do I leave the rings on the jar after they have sealed? No. After the jars have cooled, remove the rings and use them again. The jars will stay sealed. 7. Can I prepare the vegetable such as tomato juice or snaps and put in the refrigerator until the following day? Yes. There is no reason you can’t do that. However on vegetables the sooner they are canned the fresher and better they are. 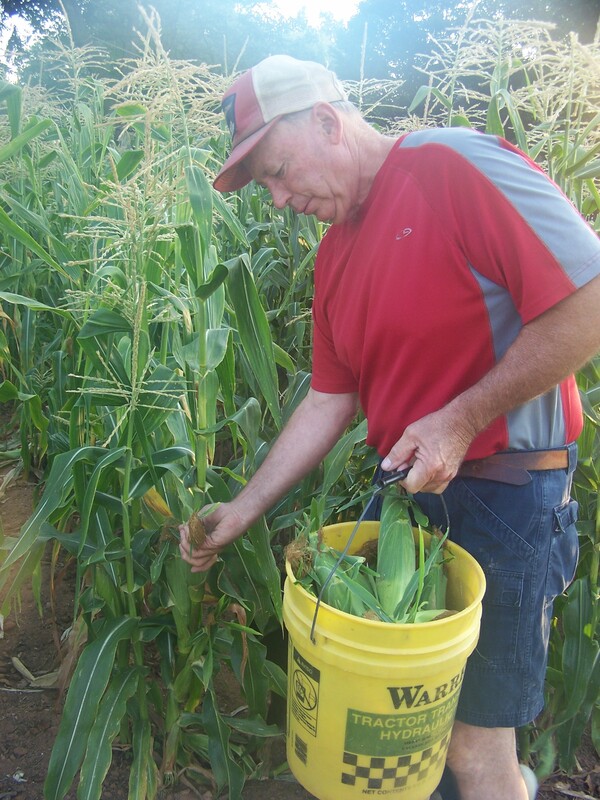 Always do sweet corn immediately. 8. Can I help a jar seal? Sometimes if you catch it soon enough. Occasionally I have one that doesn’t seal and I turn the jar upside down for a few seconds. It will then seal. This has to be done will the jar is still very hot. Once they have cooled it does not work. 9. Why does a jar break in the pressure canner? I don’t know-I had a quart of peaches break yesterday. The jar could have a small crack or weak spot in it. Do not each the vegetables or fruit from the broken jar as they could have glass in them. The rest of the jars are fine. Always use canning jars. 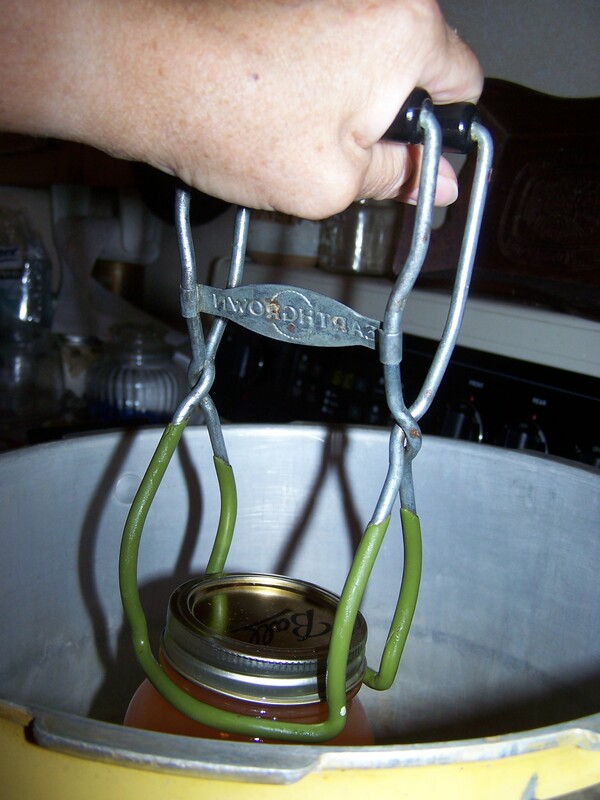 Glass mayonnaise jars, etc are not safe for canning, the glass is too thin. 10. Can I reuse my lids? No. Never. You may reuse the rings. 11. 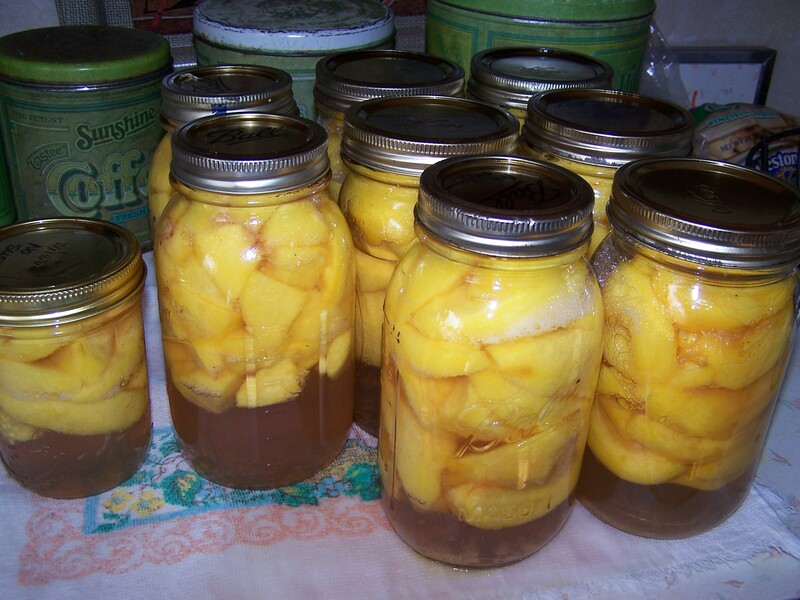 Do I need to boil the water first that I pour into the jars of snaps, peaches, etc.? I have not found that it is necessary. Tap water is much easier to work with. 12. Why does liquid leak from the jar when I am taking it from the canner or right afterwards and what do I do? Do nothing. Do not try to tighten the ring as it makes it worse. It seems to happen when I open my canner a little too quick and the inside pressure has not equalized completely with the outside air pressure. (I could be wrong). Usually the jars will seal anyways but sometimes if too much leaks out they don’t. Be sure to let the gauge come completely back to zero and the sound of air escaping from the vent has ceased before opening the canner. I try to wait a few more minutes-can let it set for 5-10-before opening the canner. Sometimes it happens if you don’t have the ring screwed on tight enough. Sometimes they will seal and sometimes they will not. 13. Can I put a half full jar in the canner? No. It will not seal. 14. What happens if my pressure gauge does not work? If the gauge does not work your canner is not safe to use. If it is building pressure you will have NO IDEA what pressure the canner is at and you could have an explosion. This is an extremely unsafe situation. 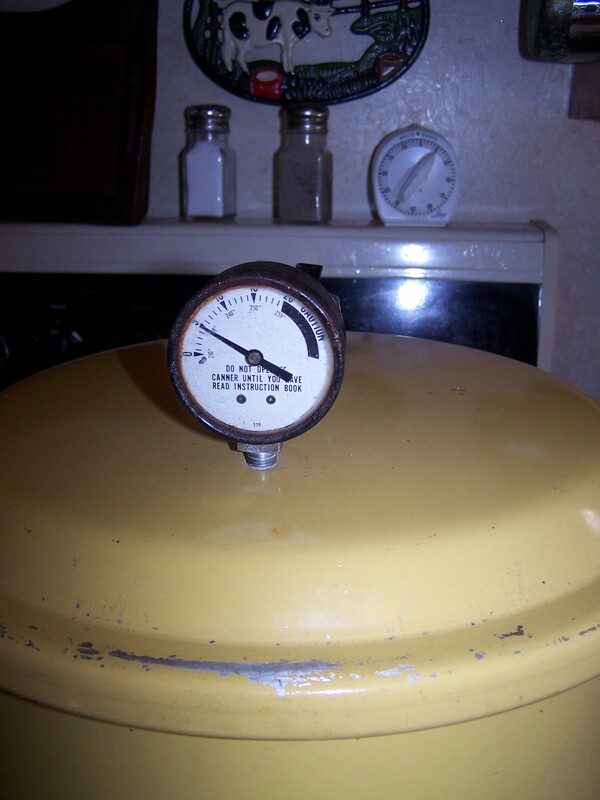 If the gauge is not working because the canner has not sealed you are not pressure sealing your jars. 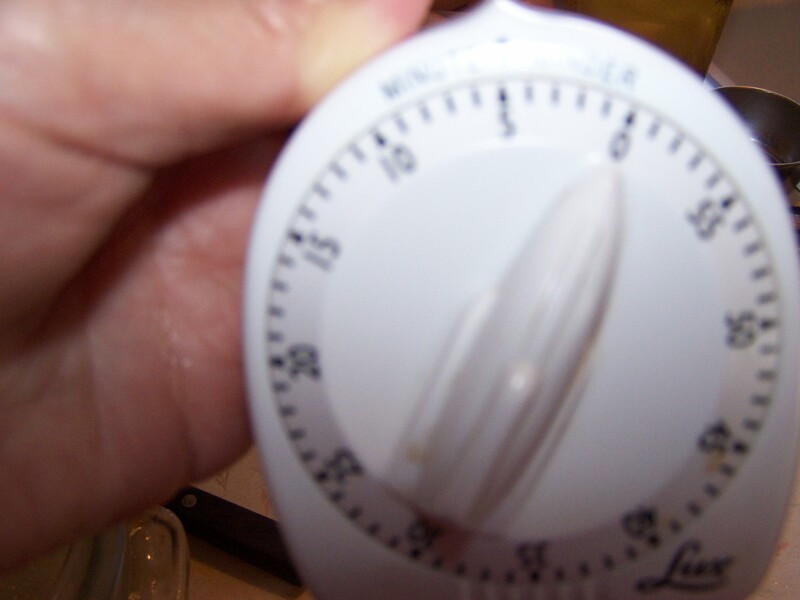 The gauge has to work or else you need to hot water bath your produce which takes longer. July can be brutal and this year was no exception. 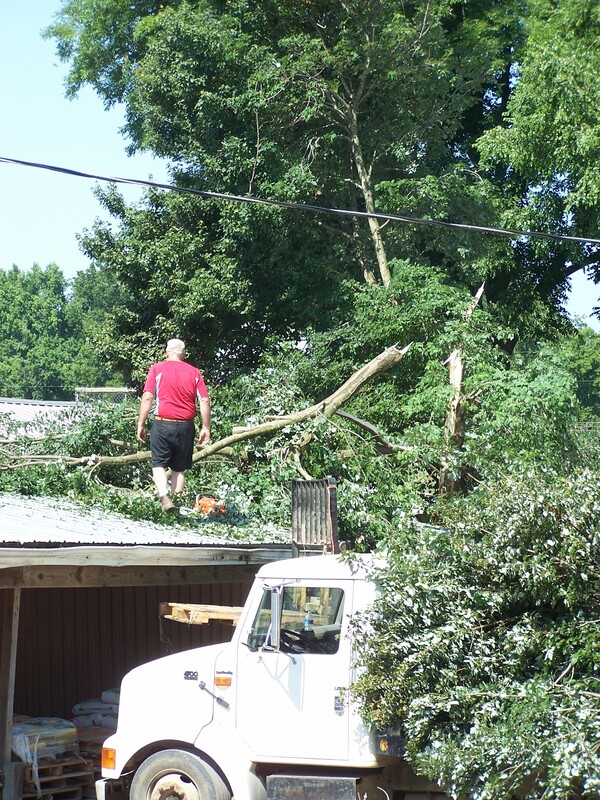 We had 100 plus degrees with high humidity for 2 solid weeks followed by a week of storms. This week it has been in the upper 90’s with high humidity and frankly, I am tired of it. My feet hurt and I am hot and miserable! More about my feet in a another blog. (Read “My Feet Hurt” in the Everyday Life or July 2012 category). 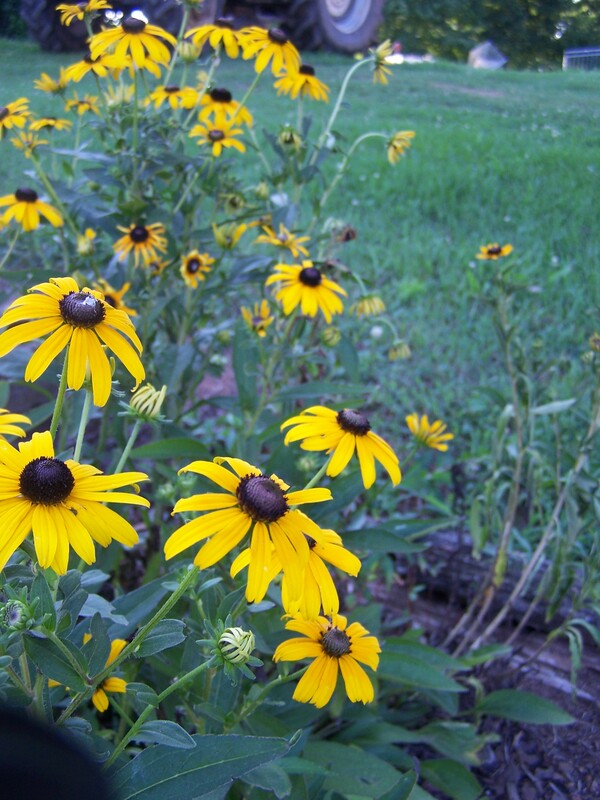 In this blog I want to show some July pictures from around the farm. 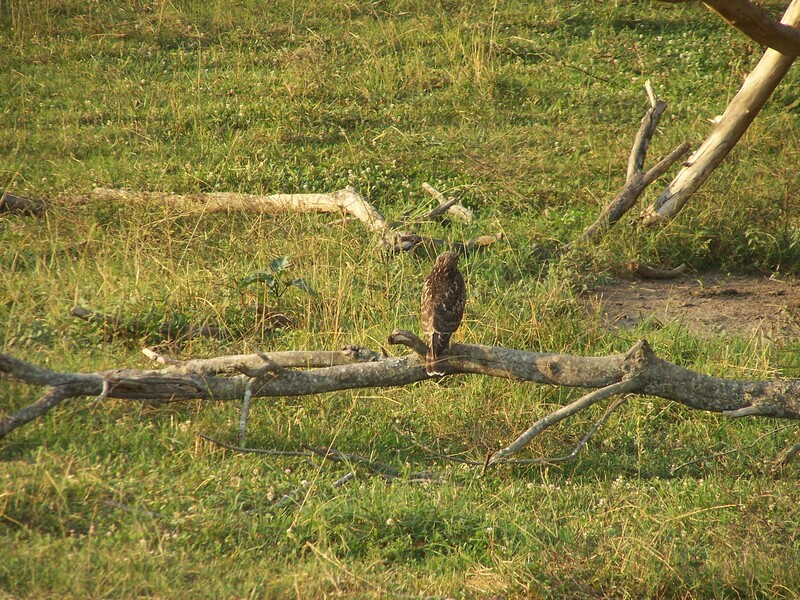 A hawk-he didn’t let me get very close! 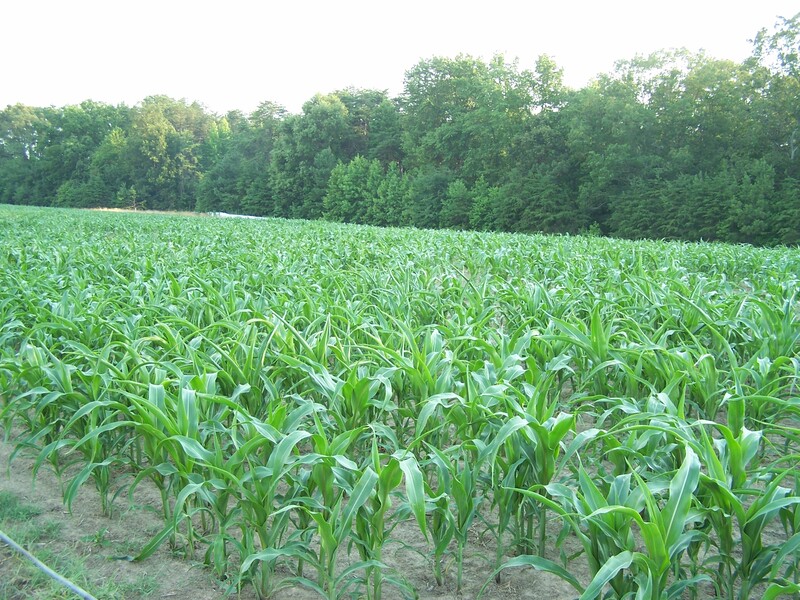 The BMR corn Gene planted for hay. 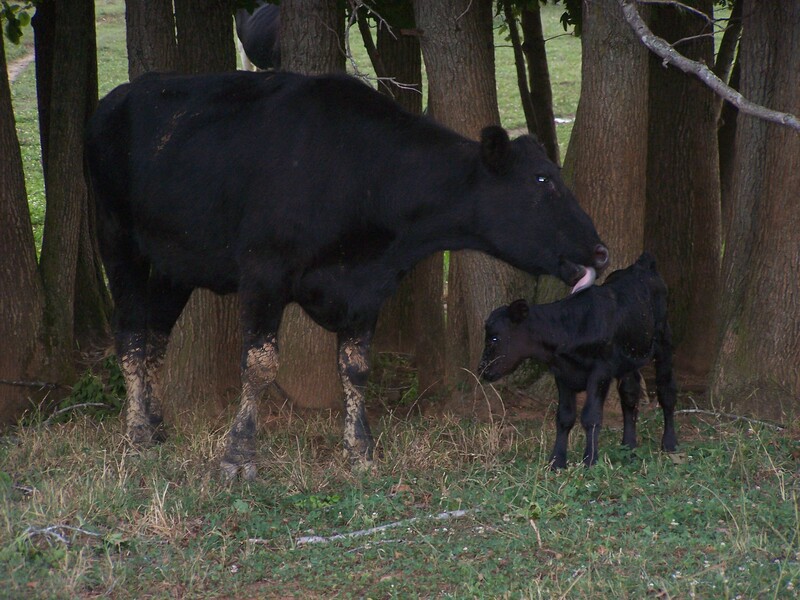 Mama cow licking off her newborn calf. A big storm damaged one of our trees. Power lines went down and we didn’t have electricity for 1-1/2 days. 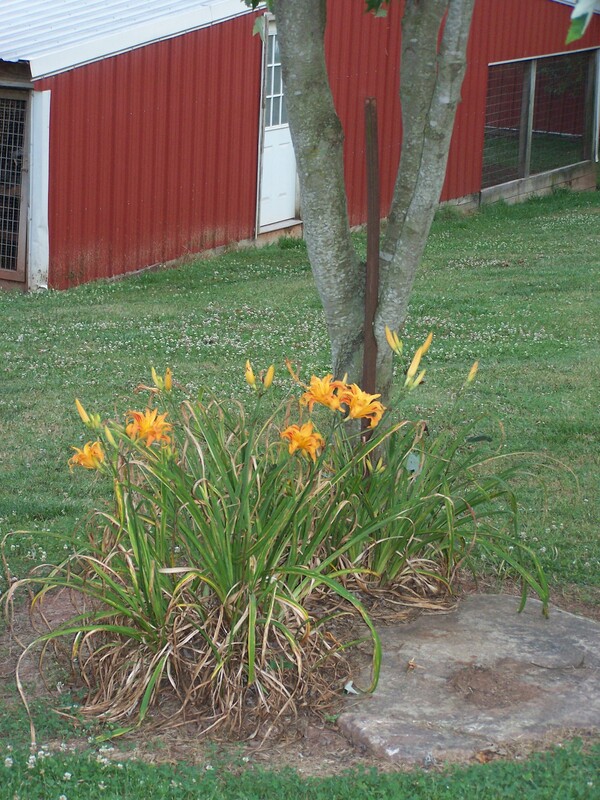 Daylillies-one of the joys of July. 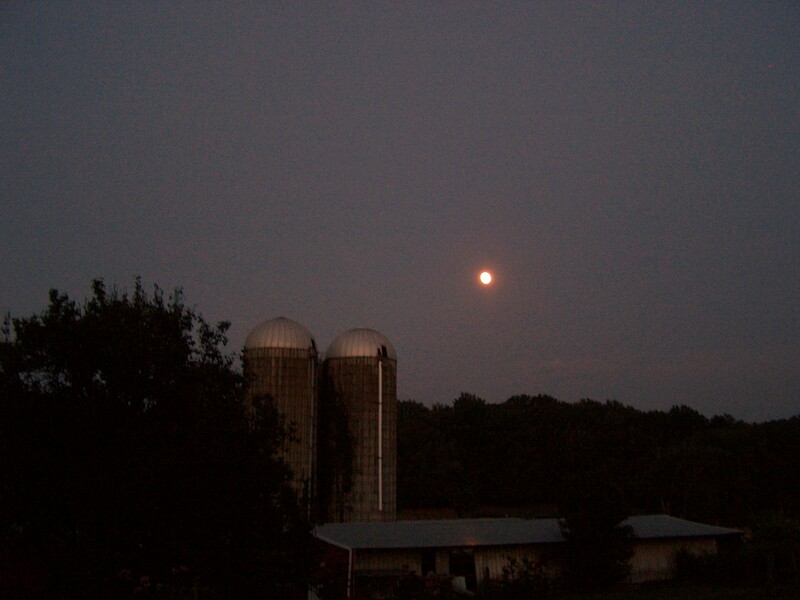 Full moon over the silos. 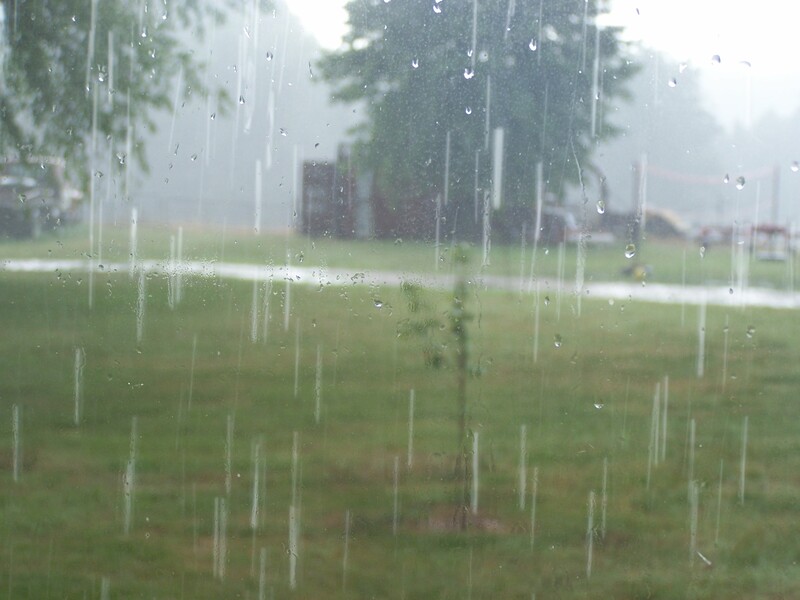 Wondering refreshing rain after several weeks of heat and drought. 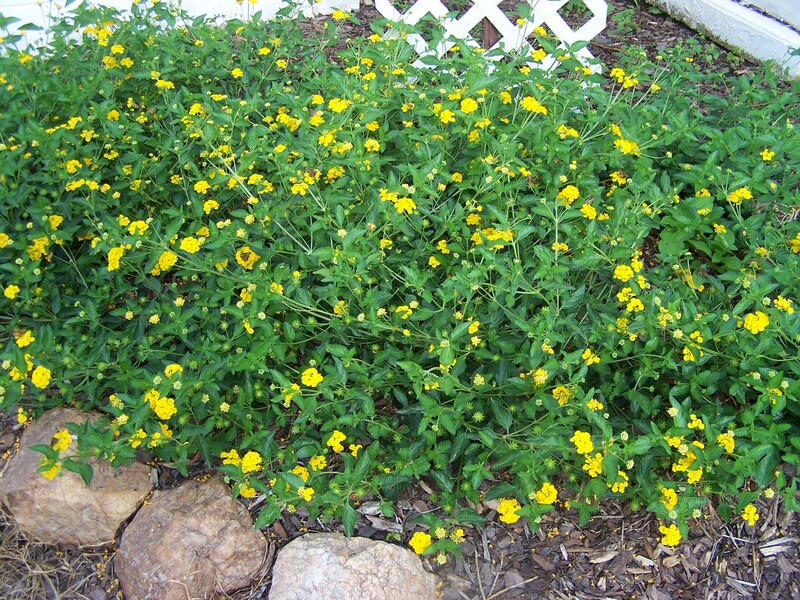 Lantana enjoying the heat and sun. 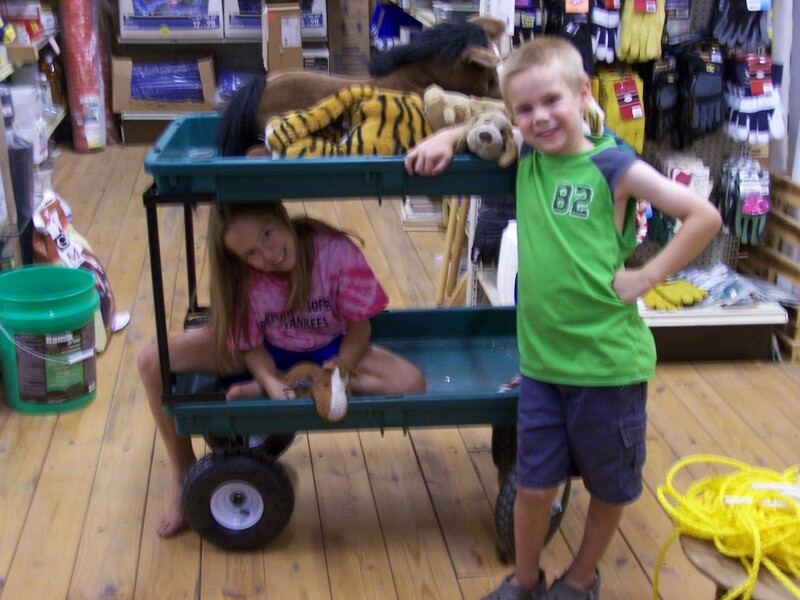 Grandkids, Karla and Ryan, were here for several days. 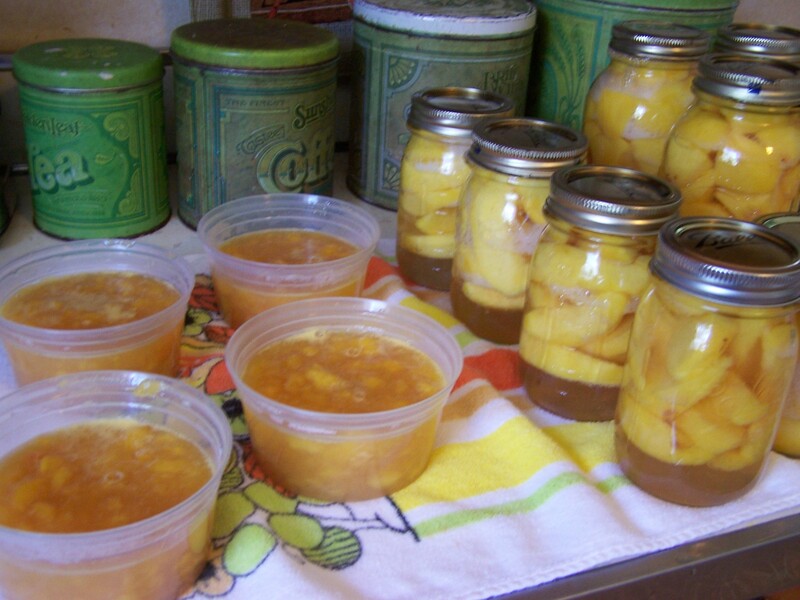 Fresh “Blushing Star” peaches from the orchard to freeze and can. Even though it is hot and humid and almost unbearable at times I would not trade my place in the country for the concrete of the city. Sometimes it pays to look around a little and you realize your spot in life is pretty good! 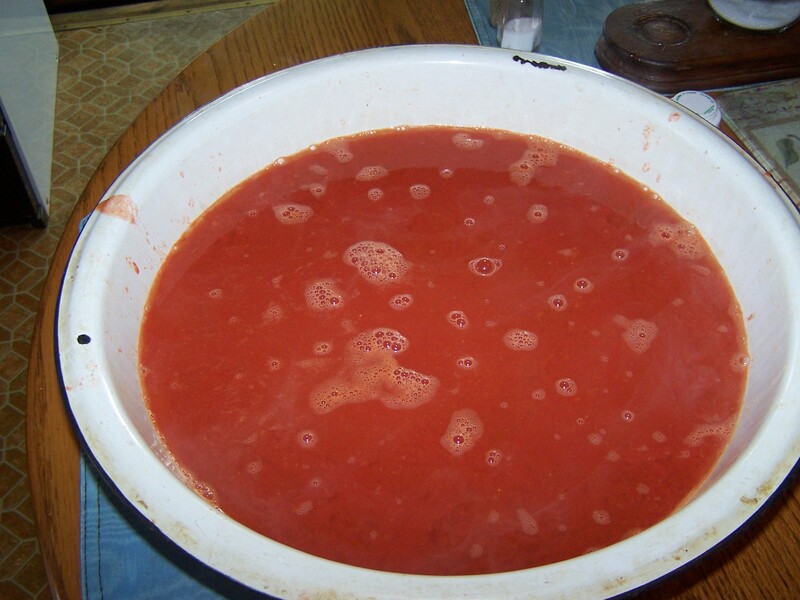 Today I will share with you how to can tomato juice. 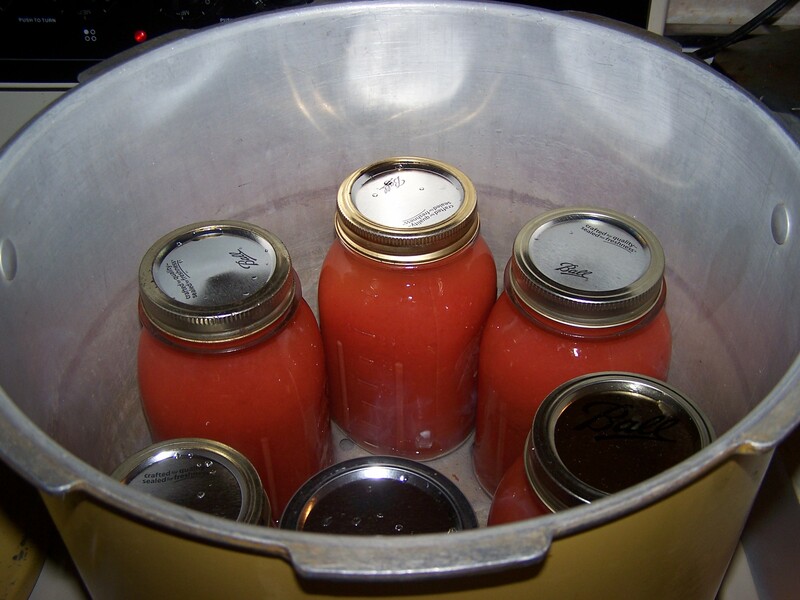 Canning whole tomatoes is at the bottom of this post. 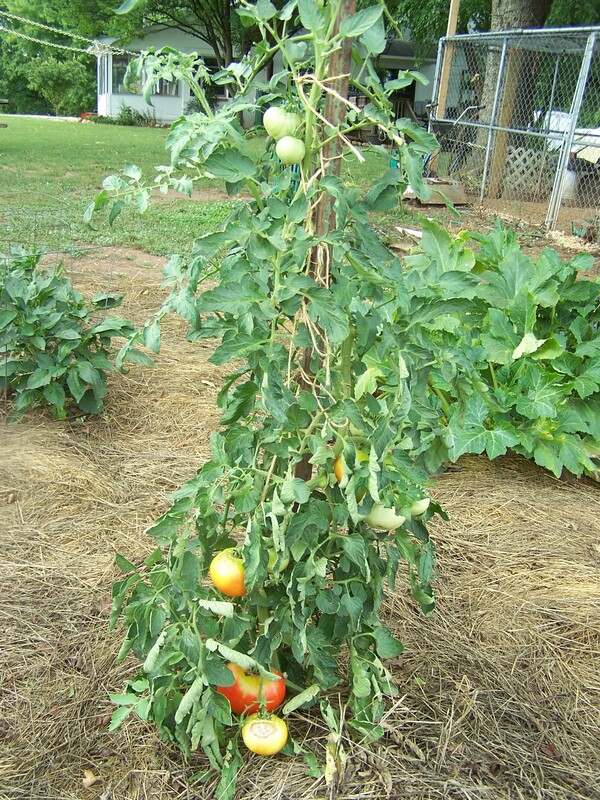 First of all I just have to show you a few pictures of my Better Boy tomato plants. 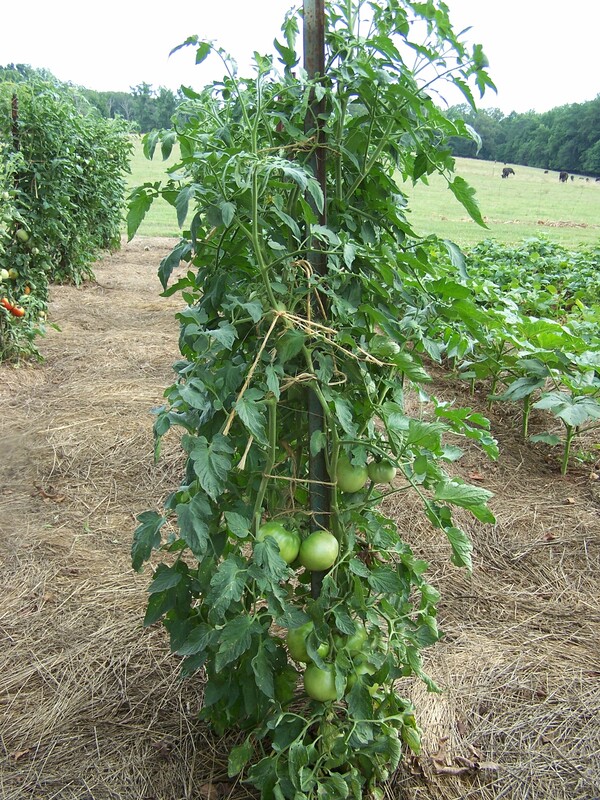 They are really doing well this year and we are enjoying fresh tomato sandwiches. I finally got enough to start canning. 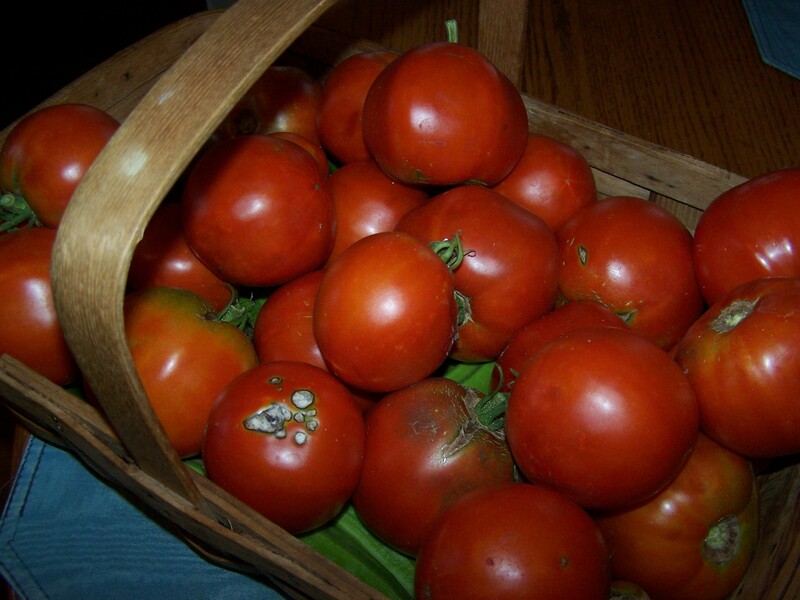 Choose vine-ripe tomatoes, wash, core, and remove any bad or damaged spots. Cut into wedges and put into a big pot to cook. 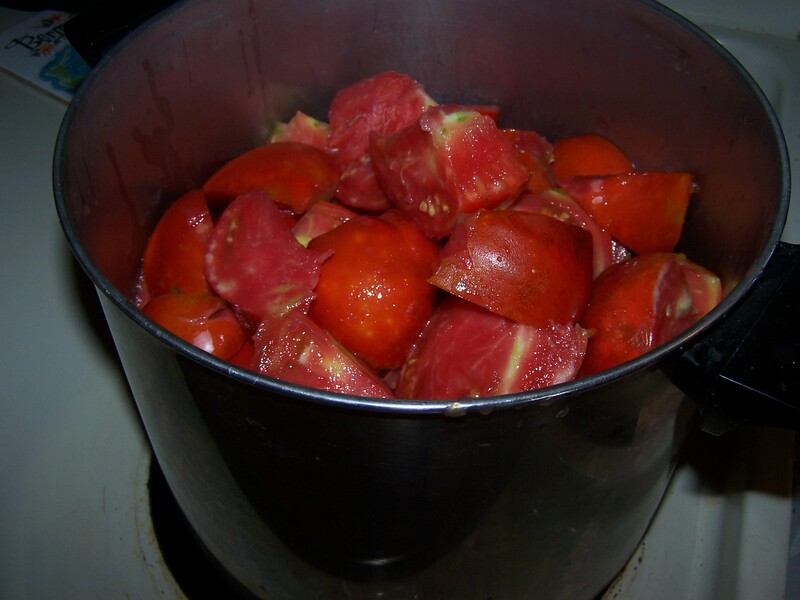 Then I take my hands and squeeze some of the tomatoes to make some juice in the pot. I usually add about 1 cup of water so the tomatoes don’t stick to the bottom of the pan and scorch. 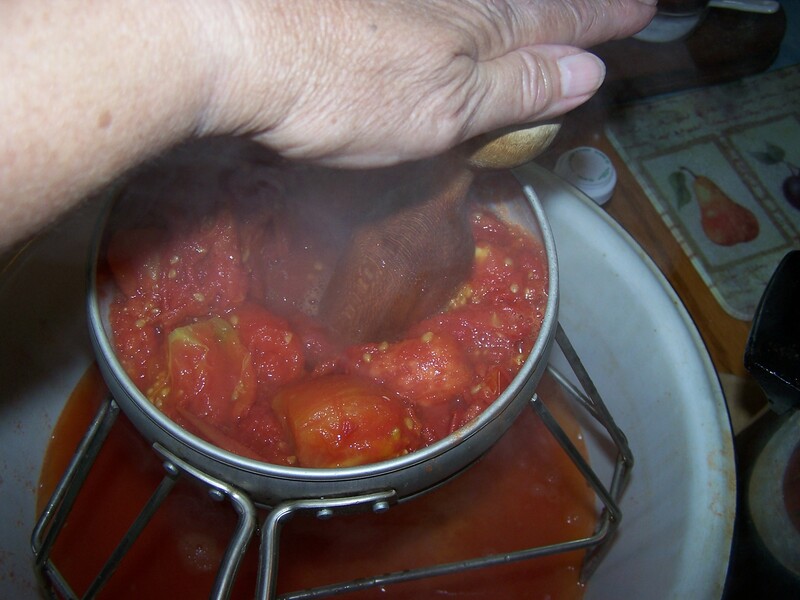 Cook the tomatoes until they are fall-apart soft and juicy. Stir frequently. It will take 15-20 minutes, depending on your size of pot. 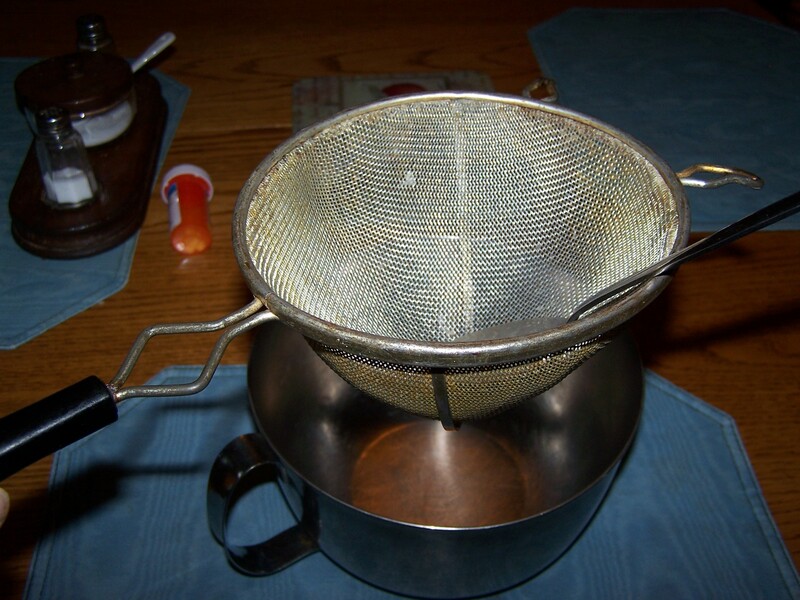 I have a very simple sieve which I use to extract the juice from the skin and seeds. I do not have a juicer. It sets perfectly into my old enamel dishpan -they probably aren’t even available any more!!! I have one of the large white plastic Tupperware bowl but it is not big enough. 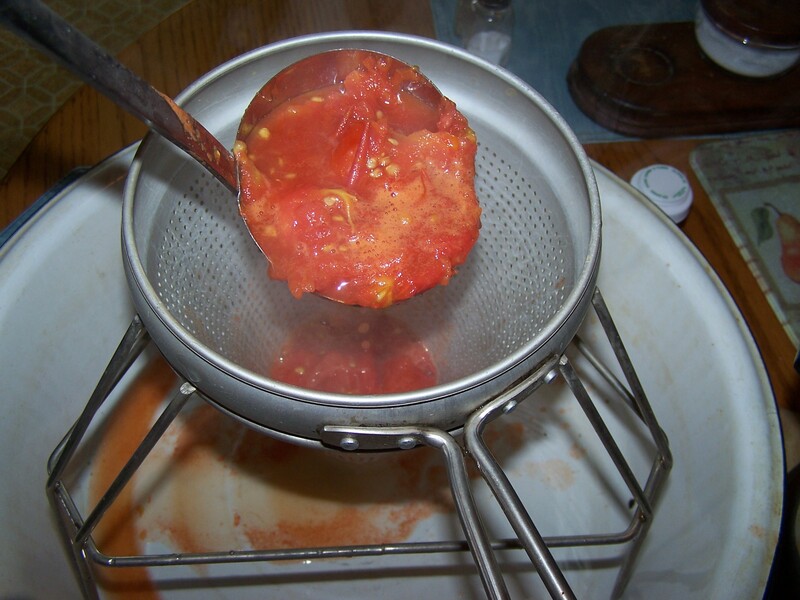 Dip the hot tomatoes into the sieve. Fill about 2/3 full. 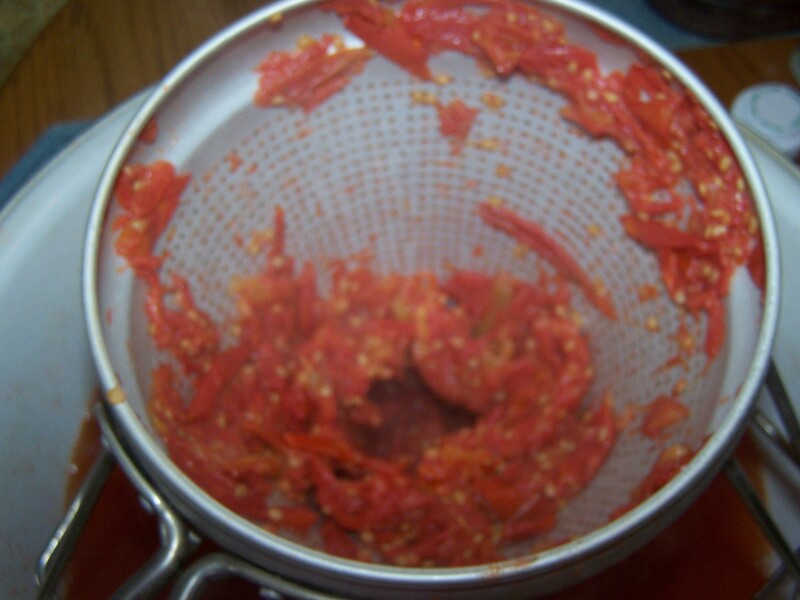 You do not want to overfill or when you spin the wooden stick around the tomatoes come out the top of the sieve. I was trying to take pictures during the process and I had to do everything with my left hand in order to snap the picture with my right so if I look a little awkward that is why. There was no way to snap the camera with my left hand!!! Center the wooden rod in the center of your hand and roll it around the edges of the sieve until all the juice is extracted and the skins and seeds are left. It is easy to do and you will soon get the hang of it. It only takes a few seconds to do. When I am done I have a bowl full of juice ready to can. 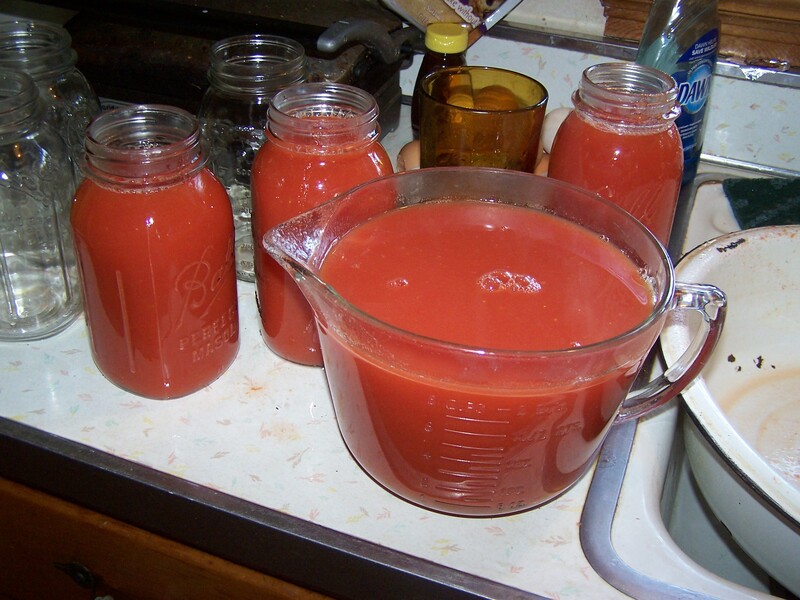 I like to pour the juice into a large 4-cup measuring bowl to pour into the canning jars. 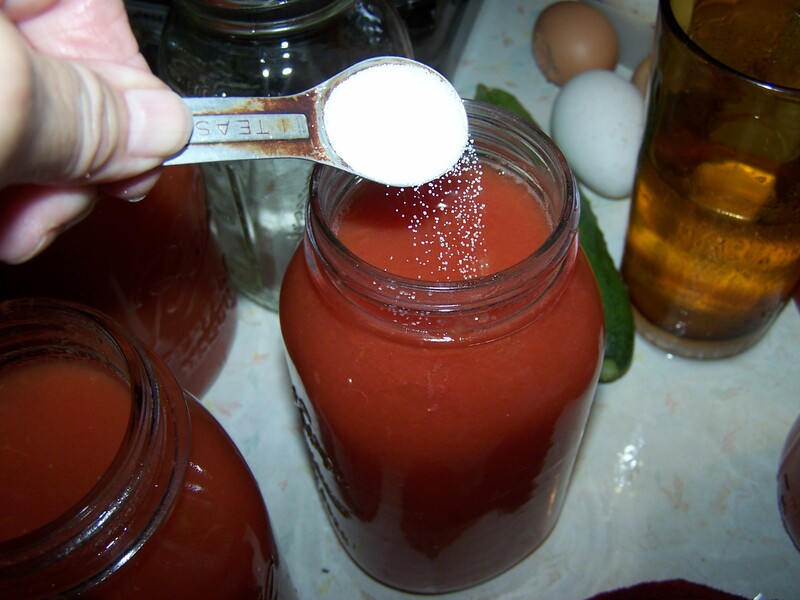 After the jars are filled to the lower rim at the neck of the jar I add 1 tsp. salt per quart. 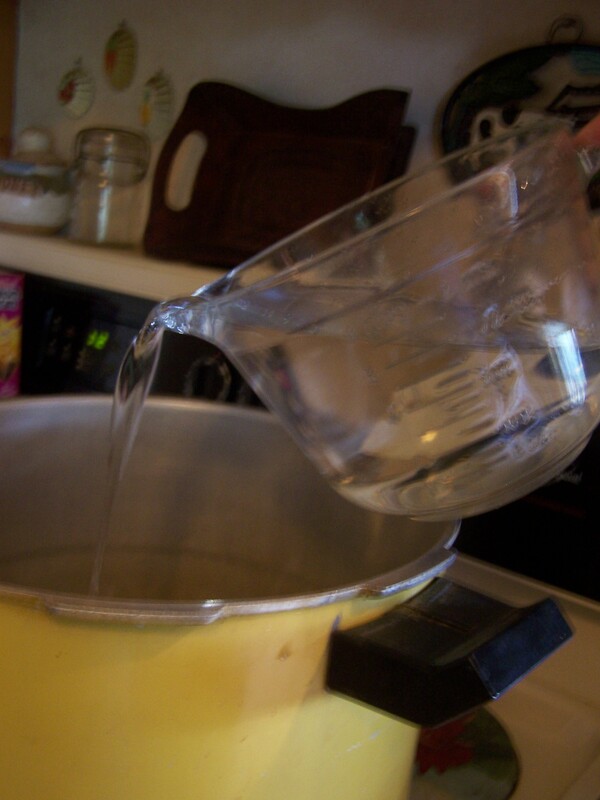 In a small pan bring the jar lids to a boil before you put them on the jars and tighten firmly. Put 2 quarts of water in the pressure canner. I add 1 tsp. cream of tarter to the water to keep the aluminum inside of the canner shiny and clean looking. Carefully set the jars into the canner. Today I had 6 quarts and 1 pint. I put them all together as it really will not make any difference. Quarts and pints are both done the same amount of time. I was a little bit short on juice so I added an inch or so of water to several of my quarts of juice. You will never be able to tell I cheated!!! Put on the lid and turn the temperature on high. After steam starts coming through the vent on top of the canner, set the weight on top of the vent hole. 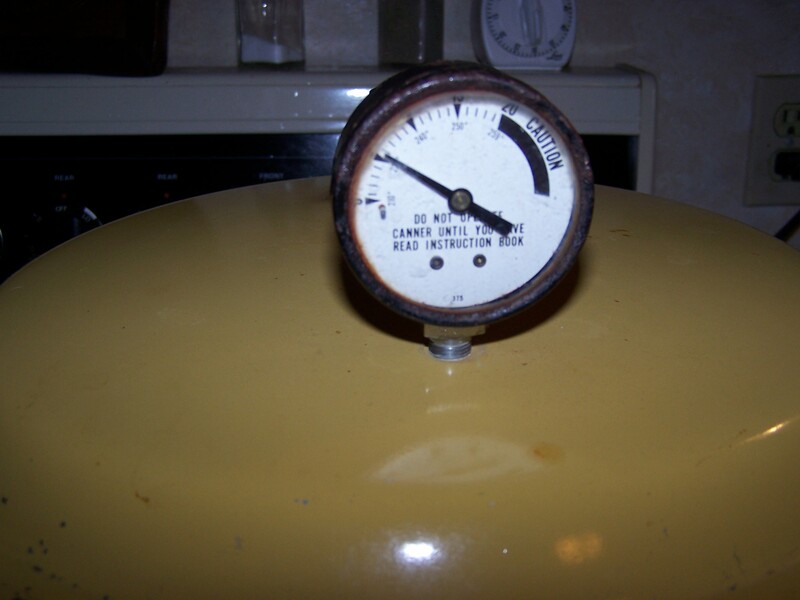 After several minutes the canner vent will close and the temperature gauge will start to rise. It takes about 1 minute to raise the gauge 1 pound of pressure. For tomatoes you want the gauge to go to 5 pounds. Adjust your temperature to keep it at 5 pounds of pressure for 5 minutes. I set my timer. Do not walk away from your canner unless you take your timer with you so that you have that constant reminder. Your canner is very safe to use and I have never had any accidents or close calls. But if you leave it and forget about it and the gauge goes into the black warning zone you might end up with a hole in your ceiling. When my gauge reaches the desired amount of pounds I can usually turn the burner back to medium high and it will hold consistent pressure. A pound or two over is no deal I do not like to be under. 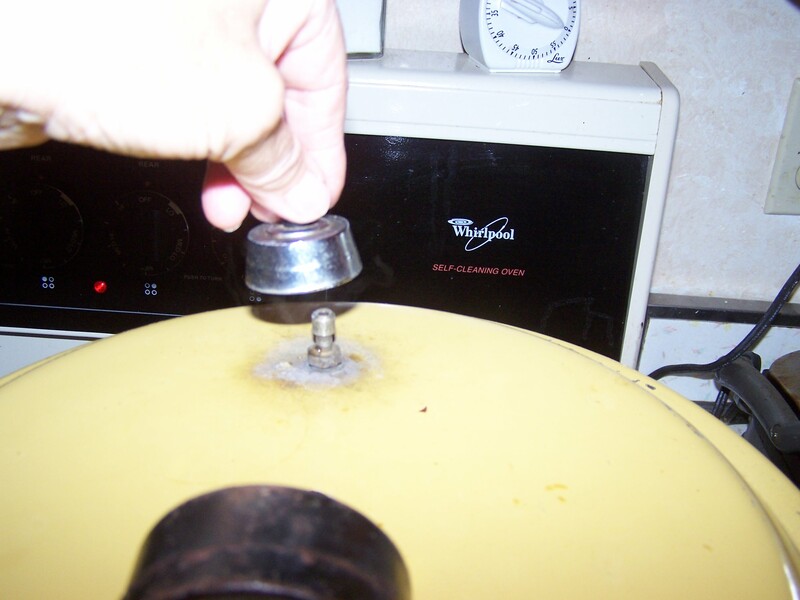 When the timer rings, turn your burner off and let the canner sit on the burner until the gauge reaches 0. It is very important that you DO NOT OPEN the canner before the gauge reaches 0. The canner is under pressure and you could have serious scald burns and broken jars if you do. 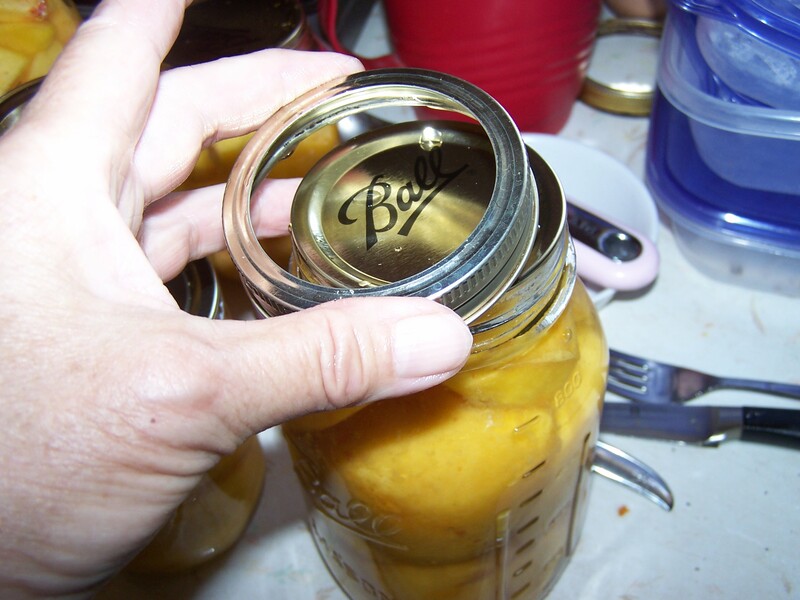 When it is 0, you can safely open the canner and remove the jars. I set the jars on a towel on the counter to cool. Within a few minutes you will hear the “popping” of the lids as they seal. This is music to the ears! The center of the lids will actually pop downward. If one has a bubble and isn’t firmly down within 15 minutes, it has not sealed. 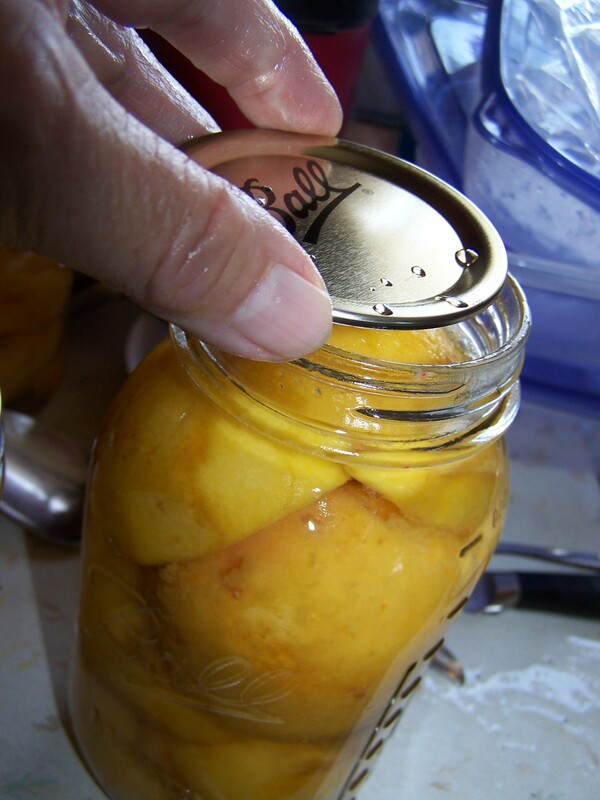 You may open the jar and immediately can it again using an new lid or you can put it in the refrigerator to use within the next several days. This evening I had one that acted like it wasn’t going to seal-all the others had so I turned it upside down for a few seconds and it sealed. I got lucky! Sometimes it will seal and sometimes it won’t. You have to do this within the first 10-15 minutes while the jars are still very hot. I let the jars cool overnight and then I remove the rings. The lids will stay sealed and put the jars in my pantry to store. Several very helpful hints…these are words to the wise!!!! 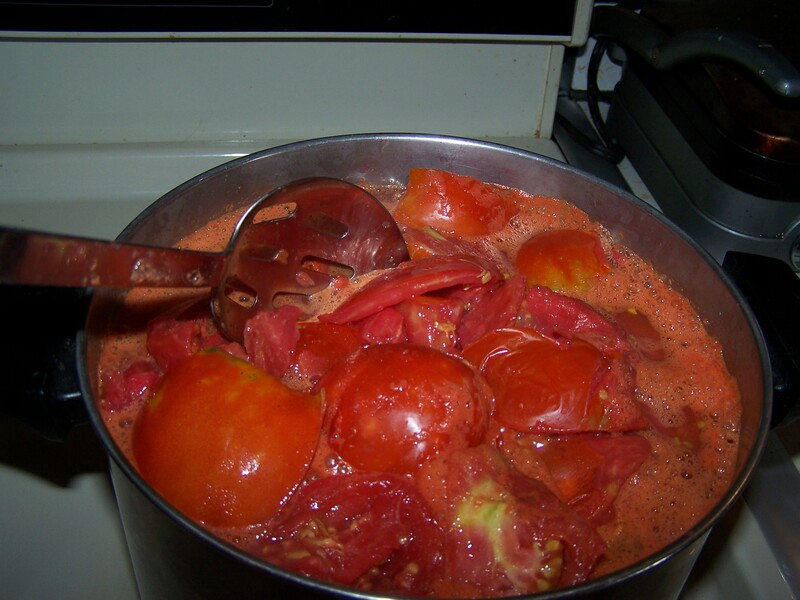 Watch your pot of tomatoes when they are cooking so they do not boil over or scorch (burn) to the bottom of your pan. You will learn your lesson very quickly the hard way if you don’t. It is not an easy mess to clean up! Always, always clean up your pots and pans immediately. They clean up easy while they are hot but if you let them sit and cool, you will have a difficult mess on your hands. Tomato juice is hard to clean. 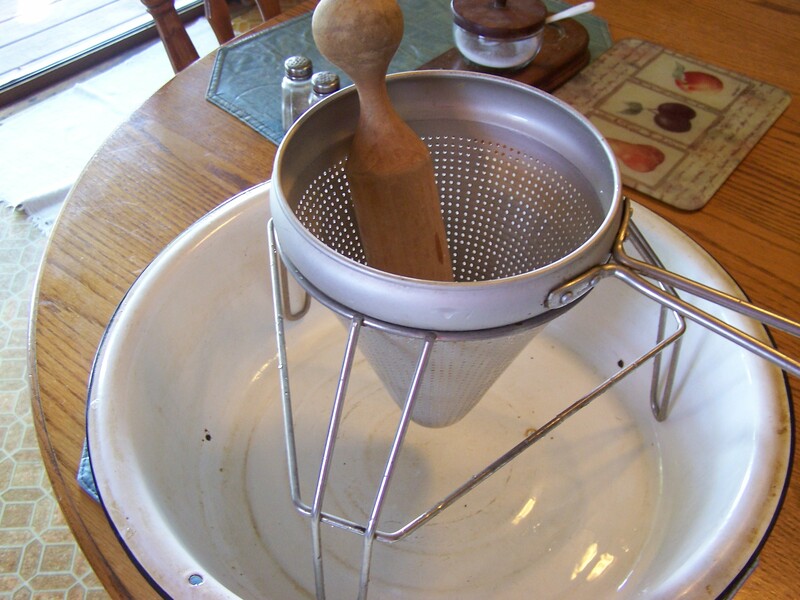 Note: If you do not have a tunnel sieve like I used, you can use a strainer, bowl and spoon. 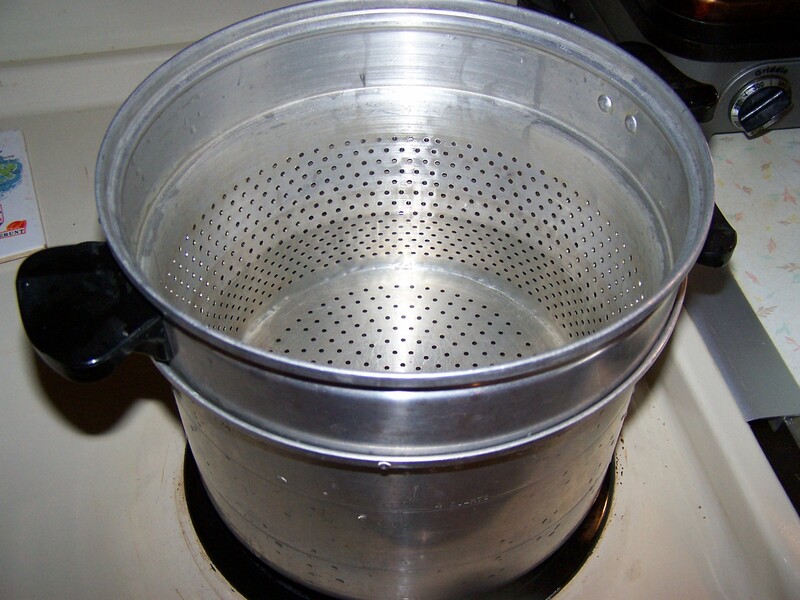 Sometimes I use this if I don’t have very many to do rather than get out my sieve. If you want you may hot water bath your juice. Cover the jars with boiling water for 15 minutes. 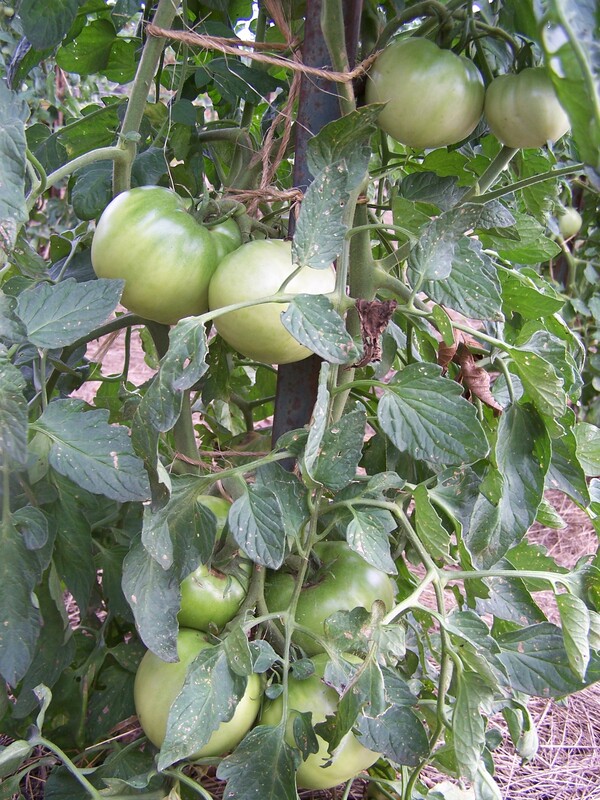 Choose vine ripe tomatoes and rinse in water to remove any dirt. 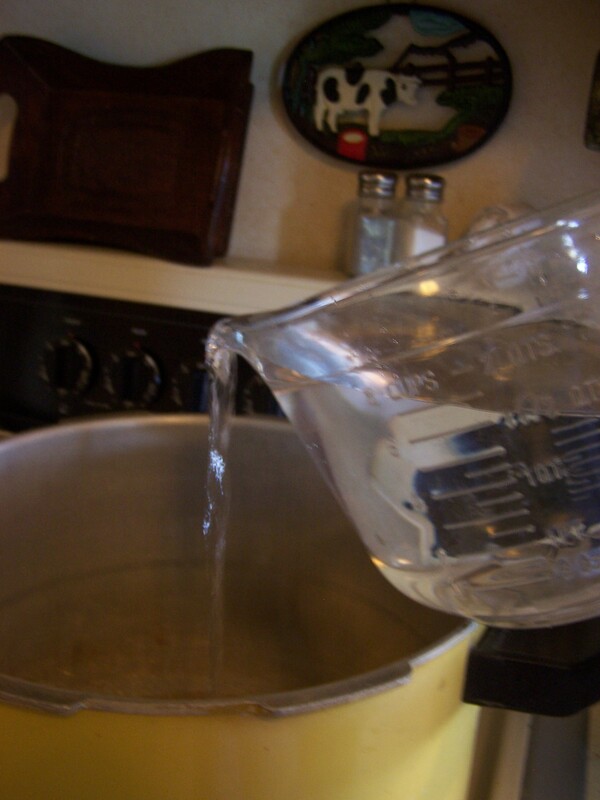 Put a large pot of water on the stove and fill about 2/3 full of water and bring to a boil. 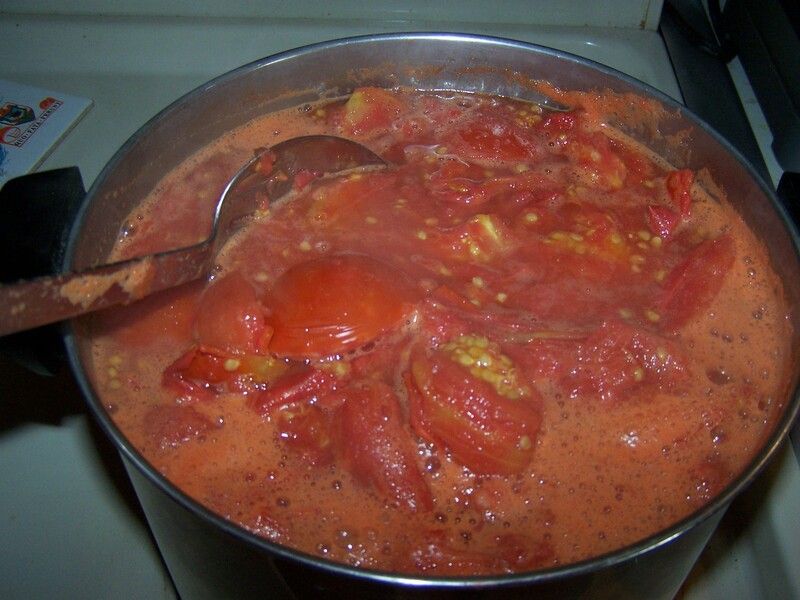 Drop the whole, unpeeled tomatoes into the hot water for about 1 minute. Depending on the size of your pan you can do maybe 10-12 at a time. 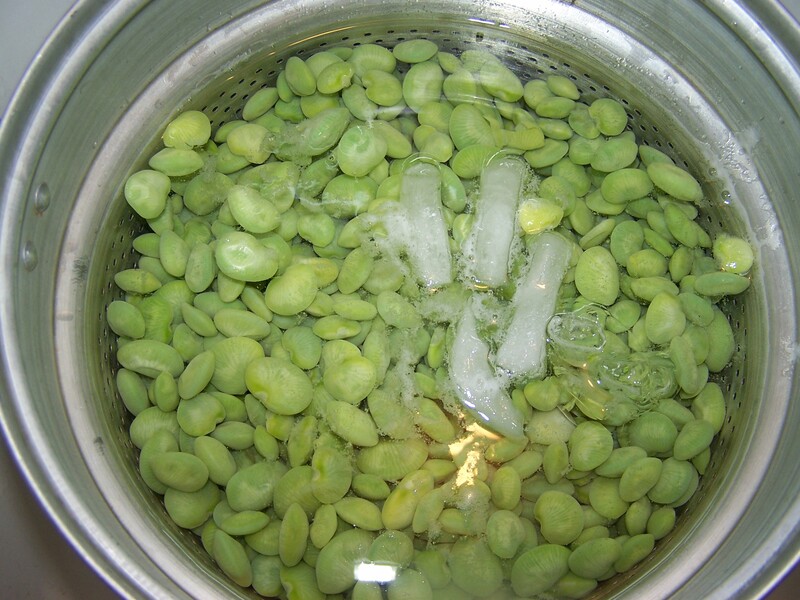 Gently remove tomatoes and drop into ice-cold water for a few minutes. The peels will crack. 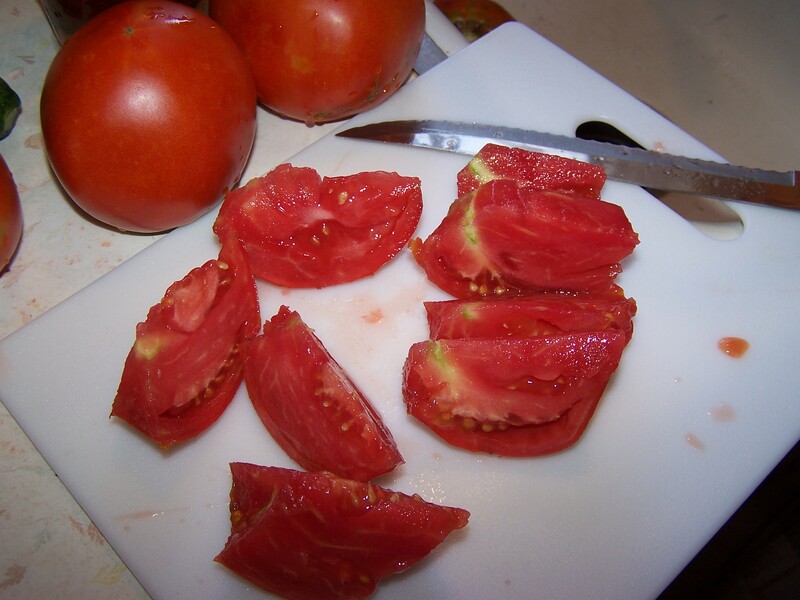 Take your knife and core the top of the tomato and the skins will slip off. 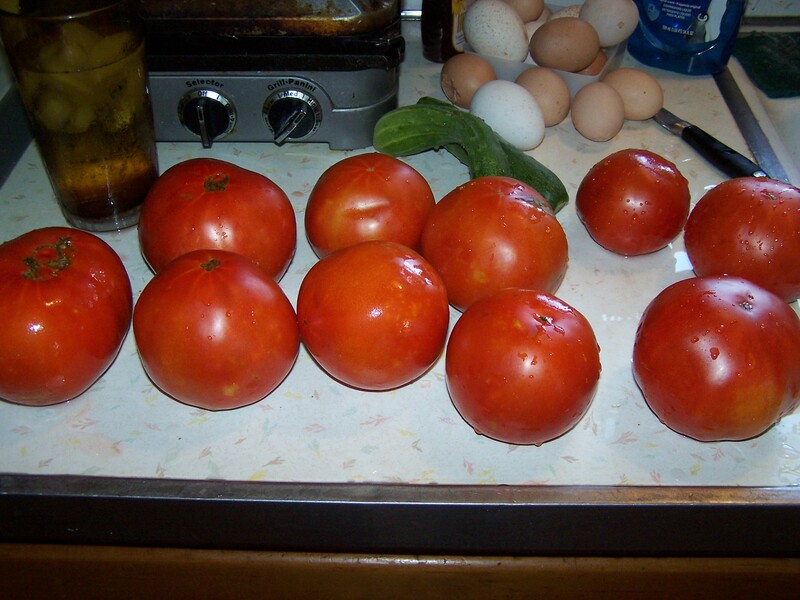 Stuff the whole or quartered tomato into quart or pint size jars. 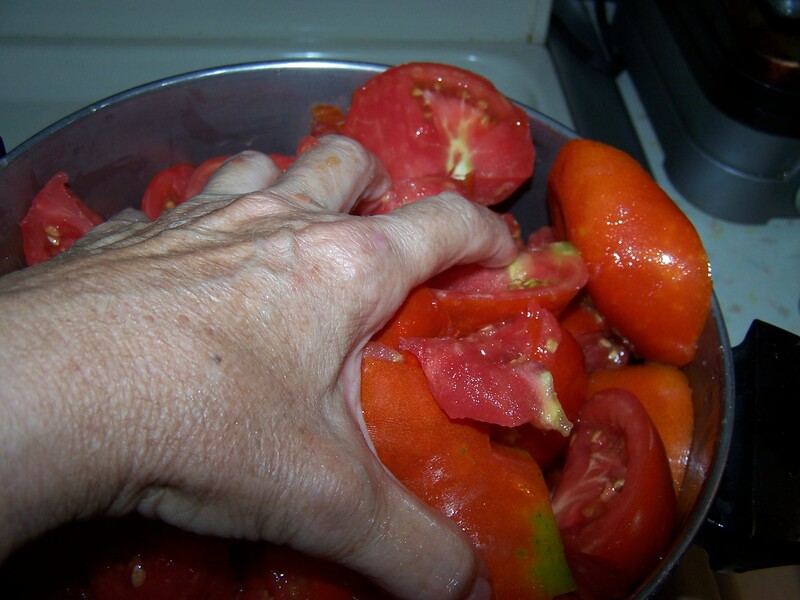 I press the tomatoes in, filling the jar. 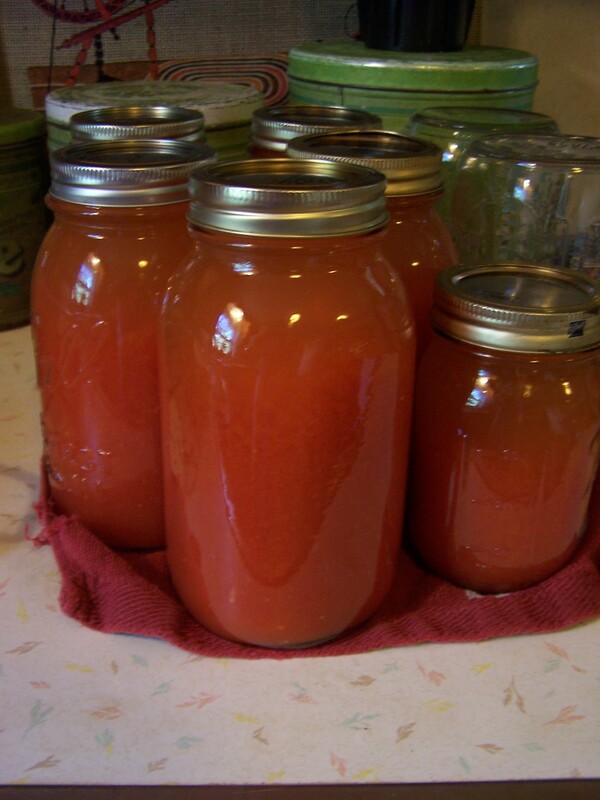 By pressing the tomatoes into the jars they make their own juice and you don’t need to add any water. If necessary, you may add some water to finish filling the jar. Add 1 tsp. salt per quart or 1/2 tsp. per pint. Pressure can quarts at 5 lbs. pressure for 10 minutes using the same method as used for juice. Pints, I do 8 minutes. We love limas. My favorite is the Fordhook variety but I like to pick them young. 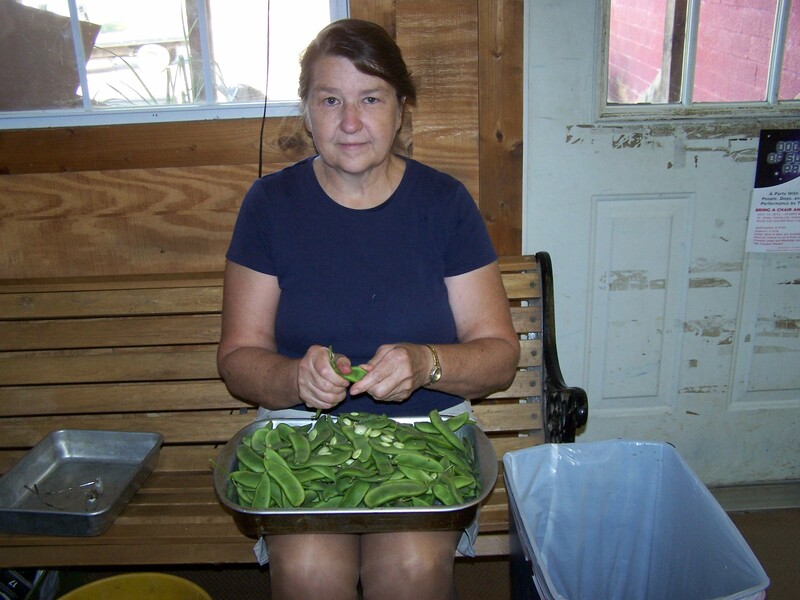 There is no comparison to homegrown limas and limas found in the grocery store. I have tried numerous times to buy them, even buying the Fordhook variety, but they are very mealy. Some things I like to can and some freeze. 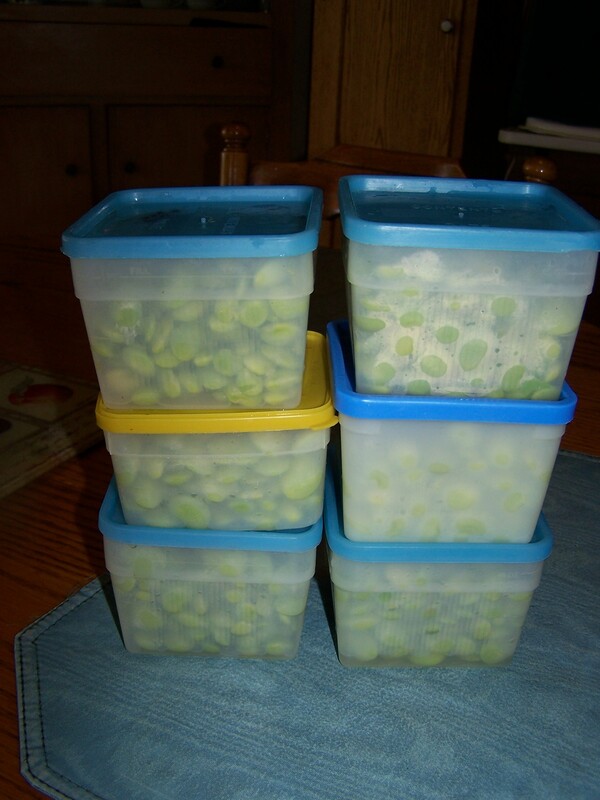 Limas I like to freeze. They have much better favor. After they are picked I find a nice place to sit and shell. 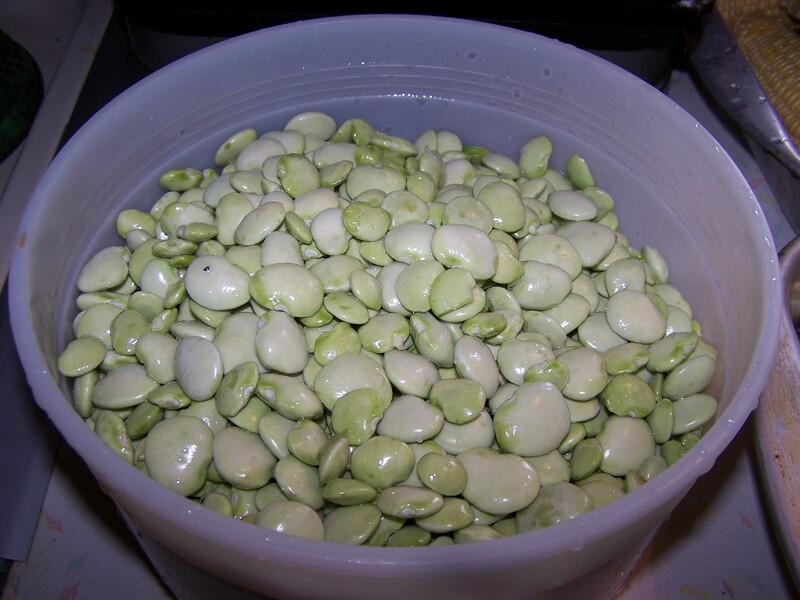 Shelling limas is not hard, just give the bean a twist and it pops open. With your thumb nudge the beans out of the pod. 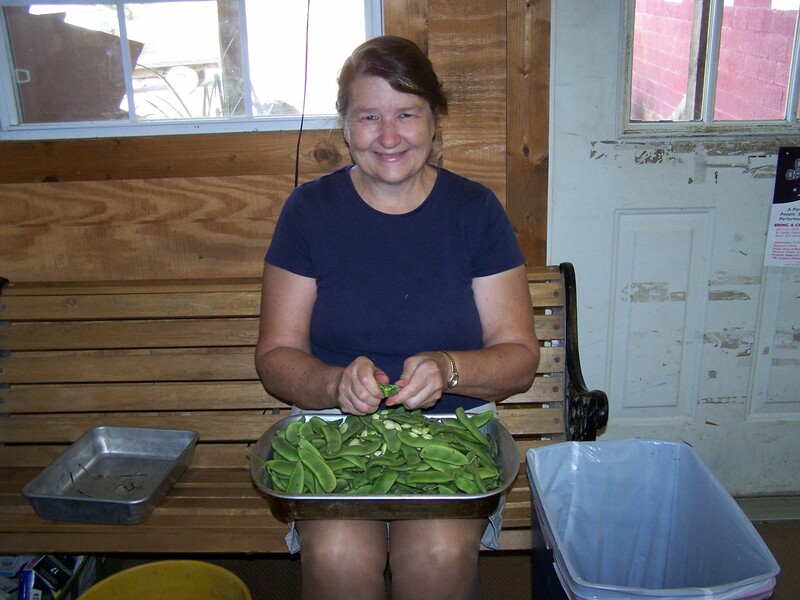 I washed the shelled beans twice to remove any dirt. Now they are ready to freeze. 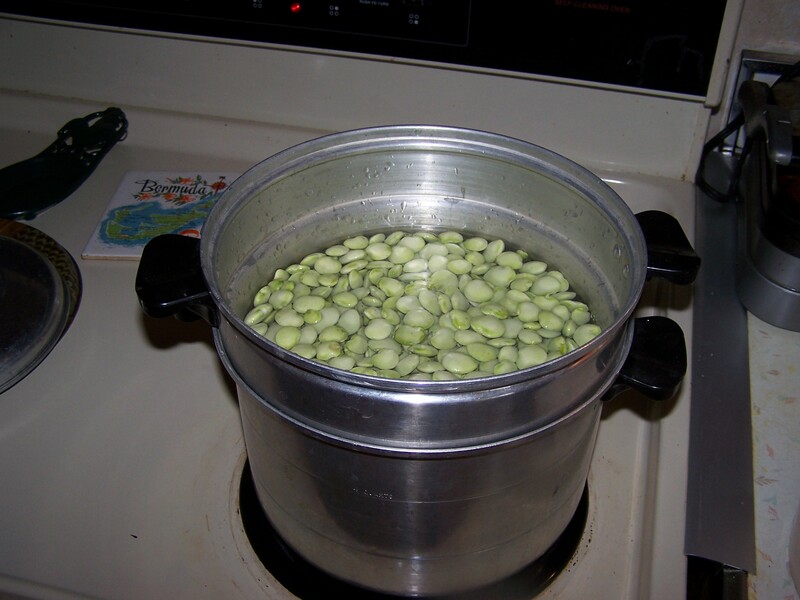 I have a special pan I blanch my beans in. Fill the pan about half full of water. 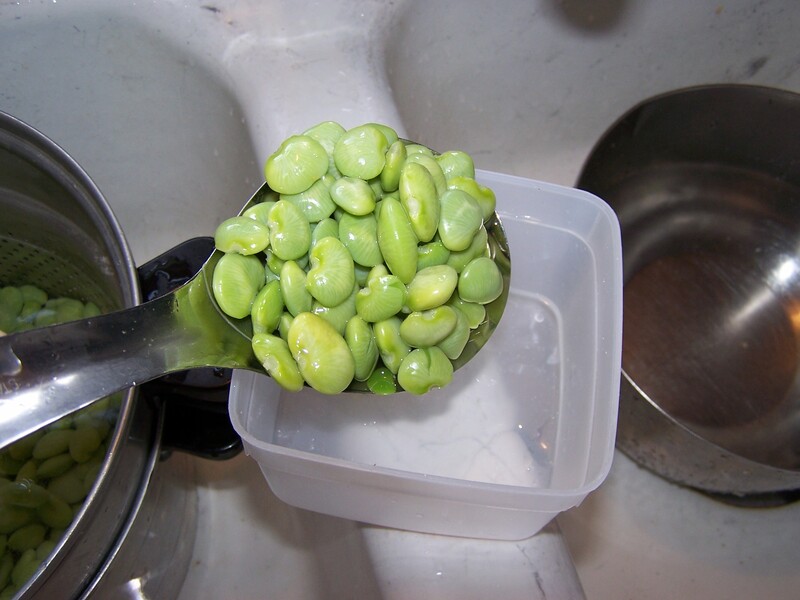 When the water comes to a boil add some limas to the top part (sieve section). Bring to a boil for 1 minute. 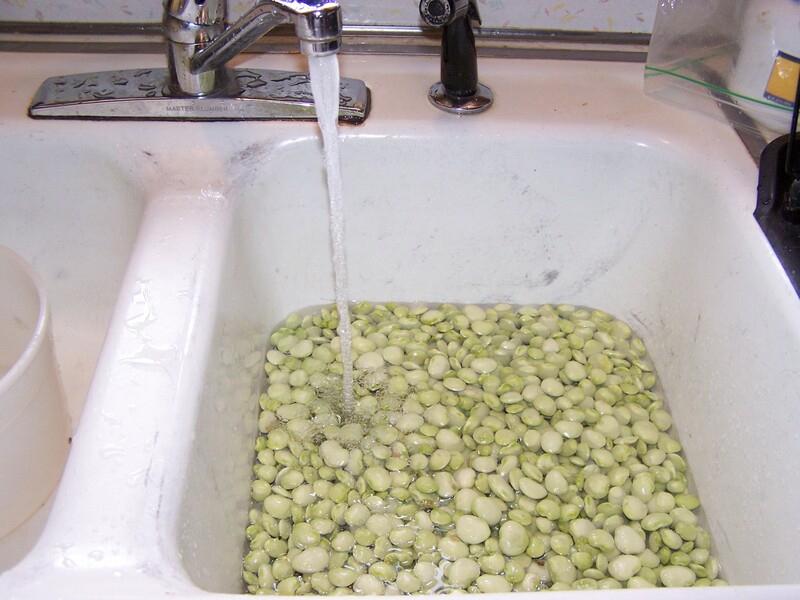 Lift the sieve section out of the pan and dump the beans into a pan to tap water to cool for several minutes. Then I dump them into ice water to finish cooling. The reason I put them in tap water first is simply to cool them some and help save on the amount of ice needed. After they are cool I spoon them into freezer boxes or bags. I write the date on the top and put them in the freezer. All of us experience “storms” on this journey called life. Sometimes they catch us off guard and others times they are predicted and we fail to prepare or heed the warning. The storm that blew across Virginia last weekend and a large portion of the east coast left a lot of tree devastation behind. 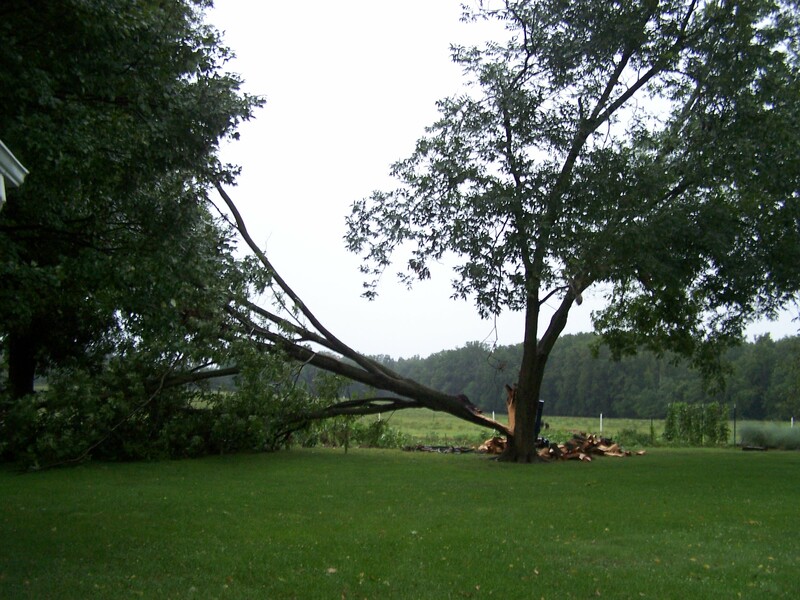 Some trees were weak but others were strong and still could not withstand the fierce straight line winds of the “derecho” storm. 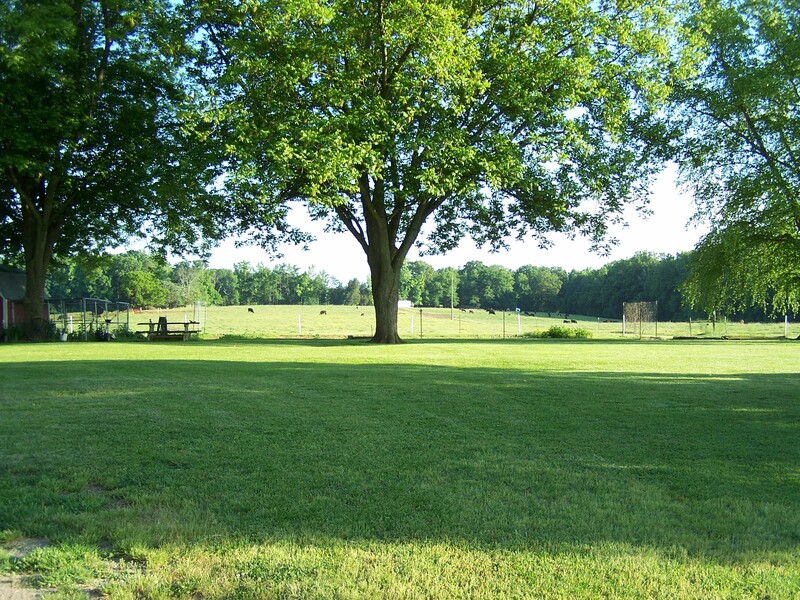 I was reminded of a “parable” I had written a year ago about two trees in our yard. 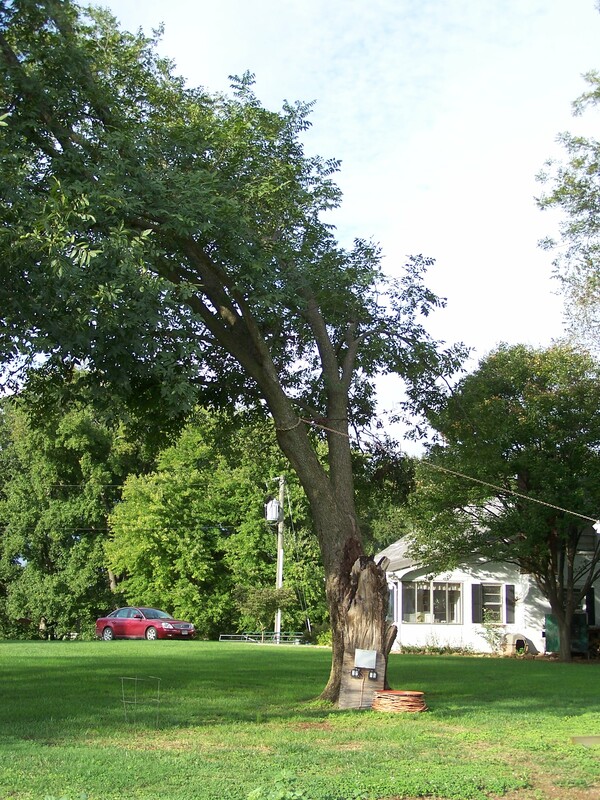 I share it with you…..
We have two trees, Walnut and Pecan, in our yard; they have a story to tell….. 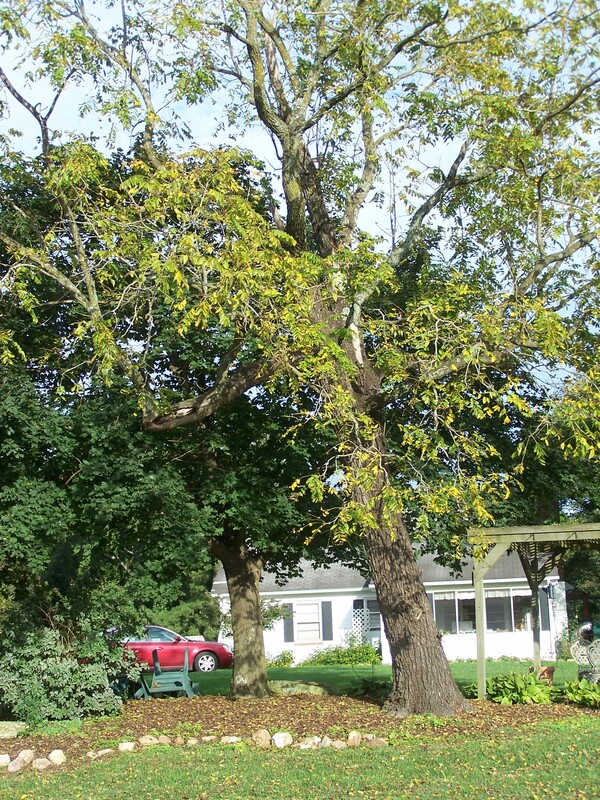 The Walnut tree has stood the test of time for many years. An early photo from our farm shows the tree in the background, already a good-size sturdy tree with a very noticeable “north” lean. 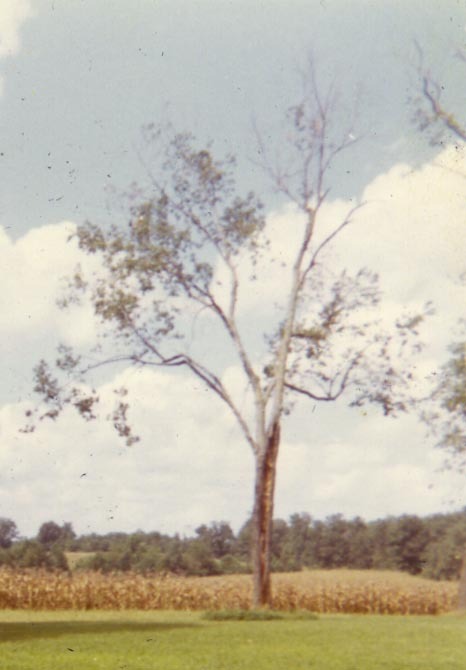 When I came to the farm in 1972, I wanted to cut down the leaning, broken up, tree with dead limbs and a hollow trunk. But my husband who can not bring himself to give up on anything that may have a shred of value was adamantly against cutting down this fine tree. I was so sure this tree would not stand much longer that I planted a tender young maple close by. But Walnut refused to succumb to the elements. Each year Walnut burst forth with a new crop of leaves and continues to produce an abundant crop of big green walnuts as if to taunt me when I had to rake them up so I could mow. Woodpeckers love the tree, knocking themselves senseless on its hard hollow bark. And each year Walnut and Maple grow a little taller, a little thicker and a little sturdier. Through the years their branches have intertwined as if they are thriving on the companionship of the other. And quite often my husband proudly points out the tree he didn’t give up on. 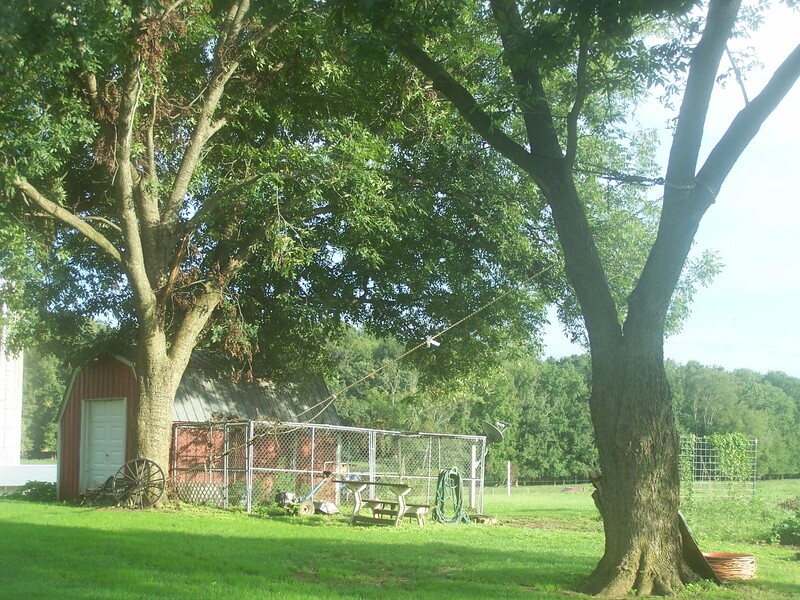 After the Hertzlers purchased the farm in 1967, Daddy planted several pecan seedlings in the yard. Forty-four years later these trees have grown into tall, stately shade trees producing generous crops of delicious pecans. But one tree in particular was hiding a deadly problem; it had developed a bad heart with decay rotting deep into its core. Early in its youth, a cow bit off the top of the tree, almost ruining it. It appeared to recover, shooting up 4 thick, strong trunks. However, in recent years we began to notice the well-kept secret. 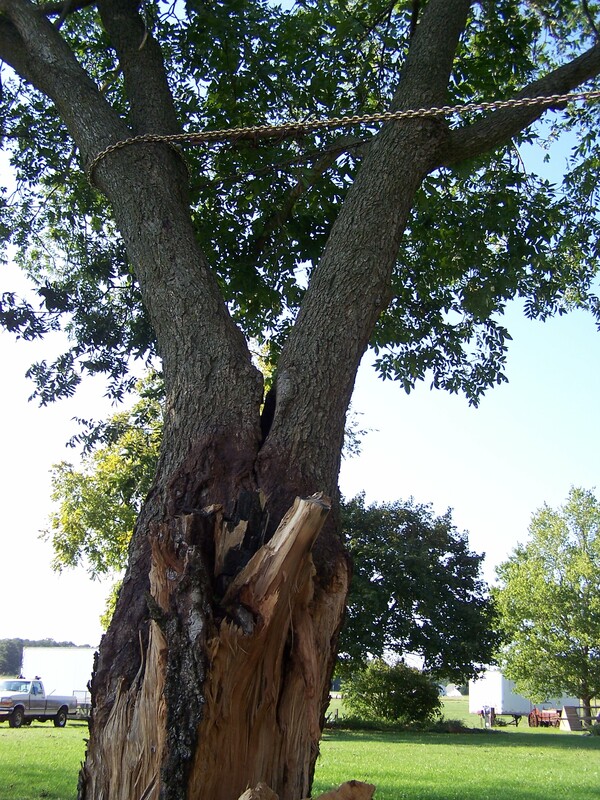 A split appeared in the trunk where it divided into four sections. Over time moisture had corrupted the flesh of the tree, seeped deep into its soul and rotted the heart. Gene came to the tree’s rescue and put a chain around the weaken trunks and tighten them together. 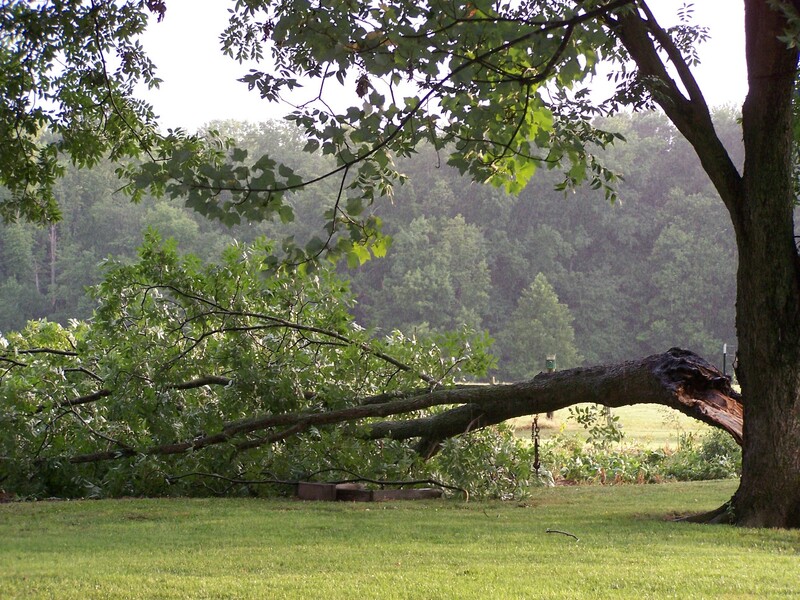 The tree continued to withstand the storms of life, including Hurricane Isabelle in 2002. 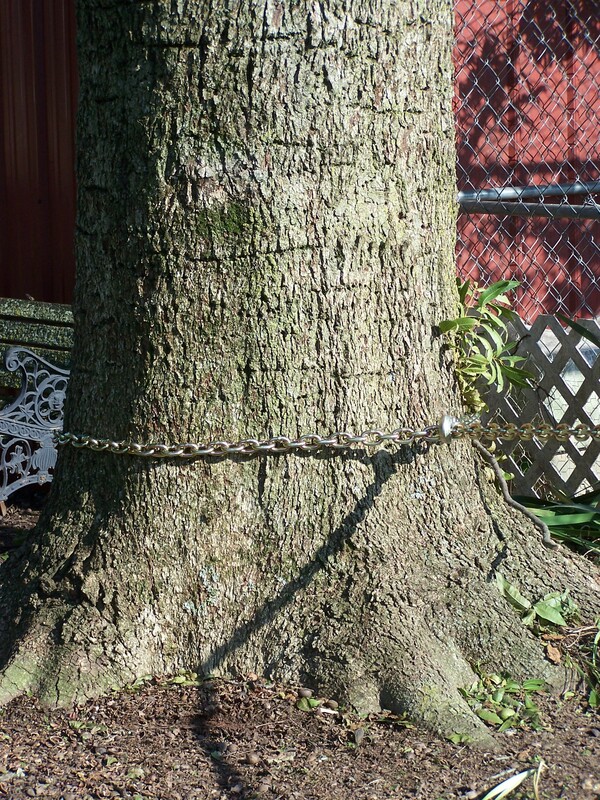 Over time the tree continued to grow and thrive causing the security chain to snap apart. We noticed what had happened to its support but put off coming to its aid. One evening several weeks ago, a sudden “big blow” broke off one the trunks revealing a tree rotten to the core. 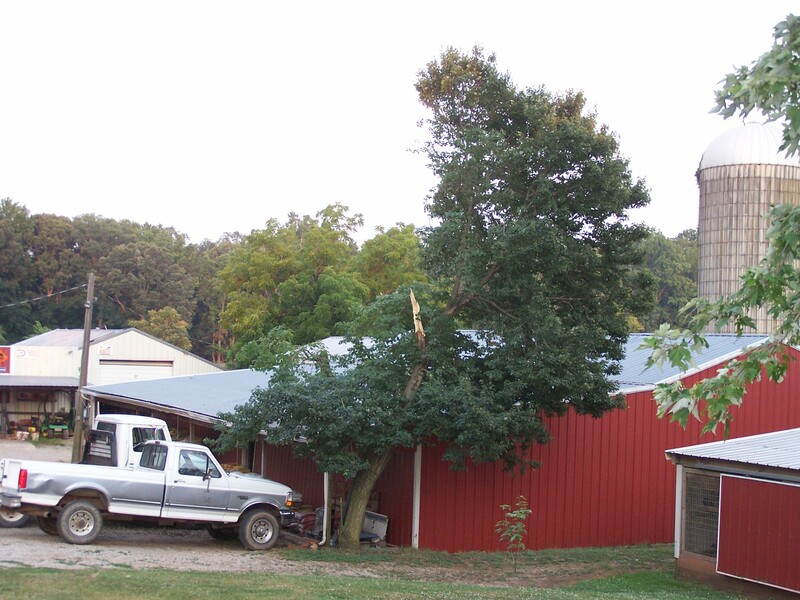 It was a sad day to see our beloved shade tree for what it really was; beautiful, stately and weak. Once again plans were made to secure the tree with chains but before it could be done another sudden storm broke off the second trunk leaving a very weak, lopsided tree to weather a major hurricane brewing on the horizon. Irene was threatening to show her strength. Again I wanted to cut down the tree and start over and again Gene was determined to help the tree survive. This time the two remaining trunks were chained together and a “lifeline” chain was fasted well above the rotten core and firmly secured to the base of a nearby tree. The “support” tree is strong and its roots go deep into the ground. 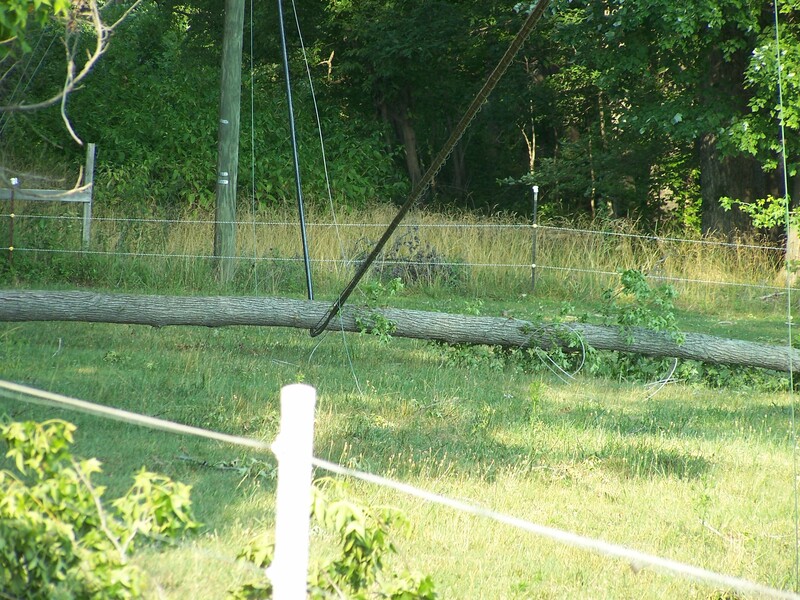 The strength of the support enabled Pecan to withstand the winds of Hurricane Irene. We realize that years of decay have taken its toll and Pecan will never again be a productive, strong and stately shade tree. Yes, it has survived a devastating crisis. Yes, it will produce some more fruit and shade; but no longer will it be a tree of honorable and pride. No longer will it be able to stand on its own. For he shall be like a tree planted by the waters, which spreads out is roots by the river and will not fear when heat comes; but its leaf will be green, and will not be anxious in the year of drought, nor will cease from yielding fruit. The heart is deceitful above all things, and desperately wicked; who can know it? I, the Lord, search the heart; I test the mind, even to give every man according to his way, according to the fruit of his doings.